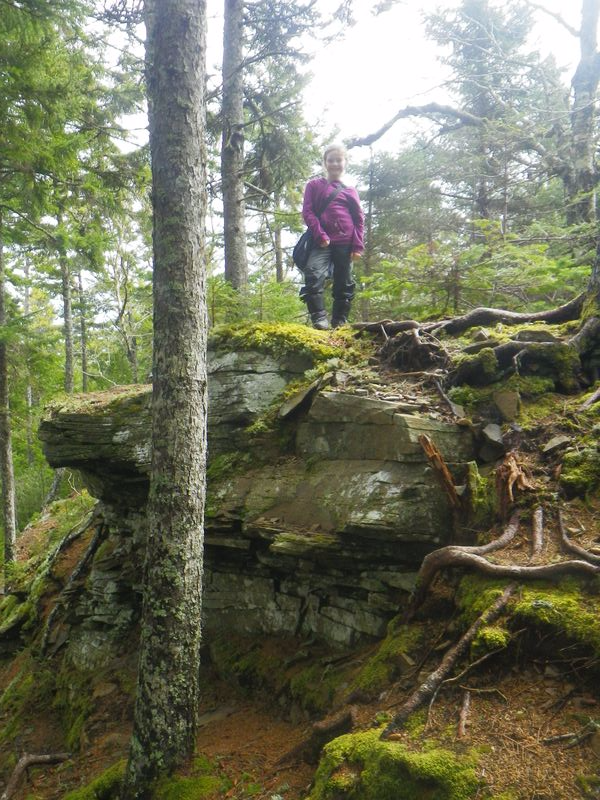 A 20.4km trail on the southern coast of Fundy National Park, the Coastal Trail is full of nice views, interesting rock formations and geography. 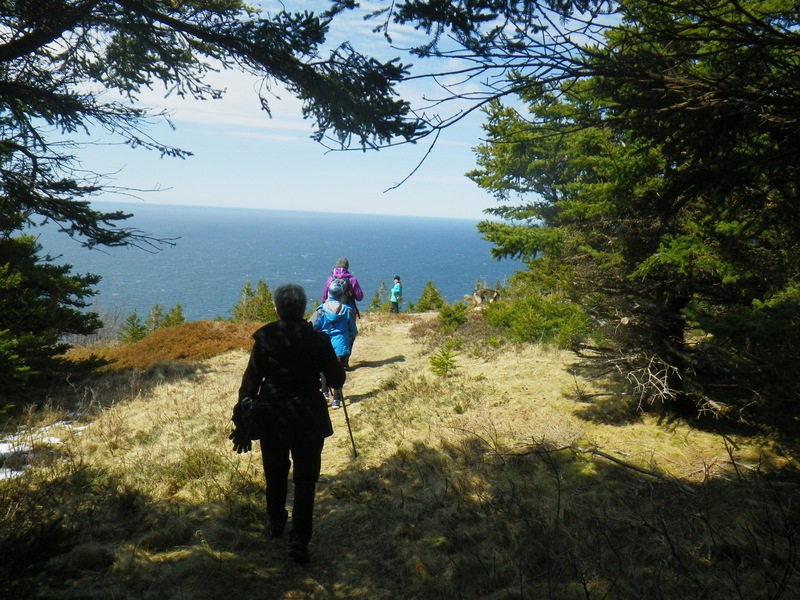 The trail follows just above the steep cliffs that line the Bay of Fundy and is divided into two sections. 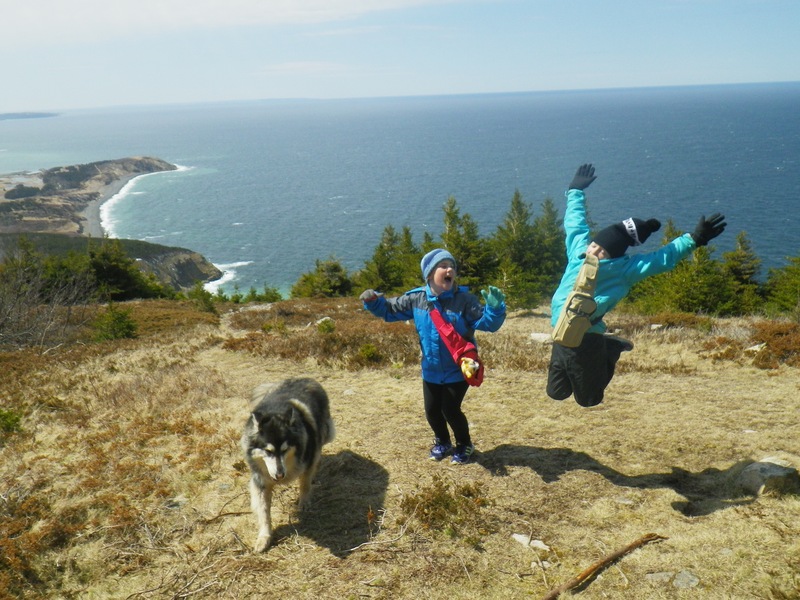 The first section is 3.2 kilometres, leading from the National Park pool parking lot area to Herring Cove, a small beach inset on the shore. The second section leads from Herring Cove to Point Wolfe and covers 6.9 kilometres. Both sections have steep ascents and descents and care should be taken close to the edges as the rocks and earth may be eroded underneath! 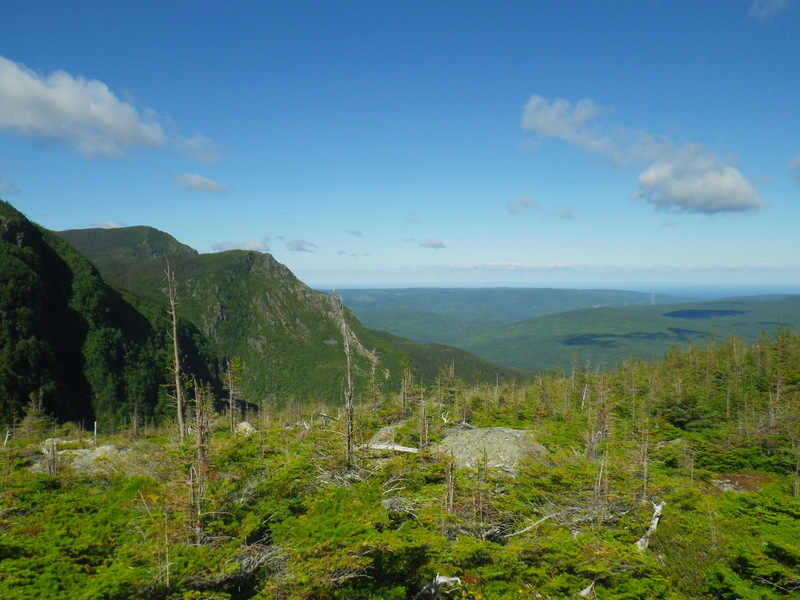 Exceptional views can be found at look offs along the trail. One unique area of the trail is ‘Hell’s Kitchen’, where the trail crosses ridges with deep sinkholes all around. 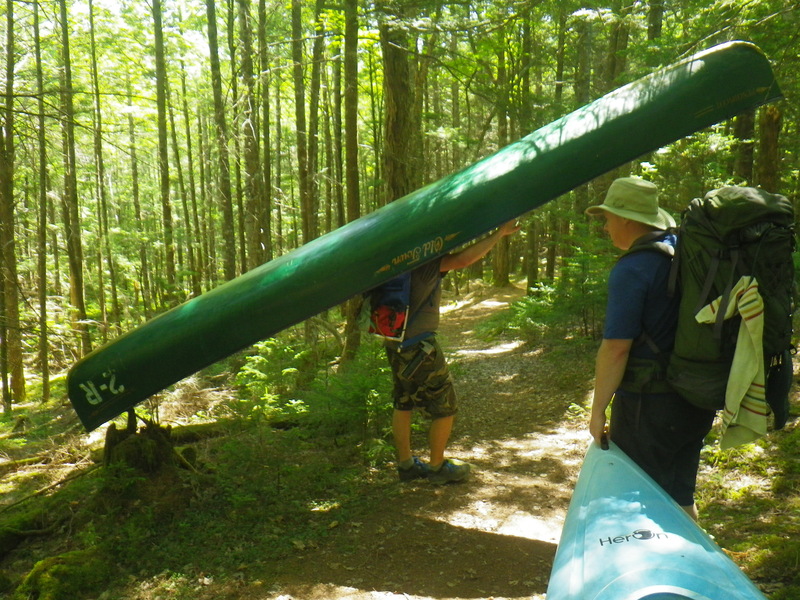 If doing the whole trail, be prepared for a long and challenging day. 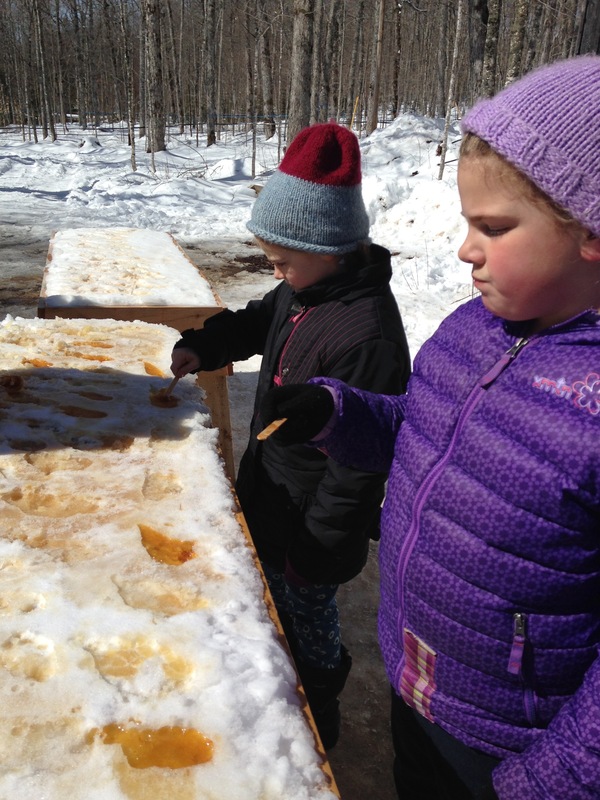 This year's annual trip had us exploring the Chic Choc mountains of the Gaspe Region of la belle province: Quebec. 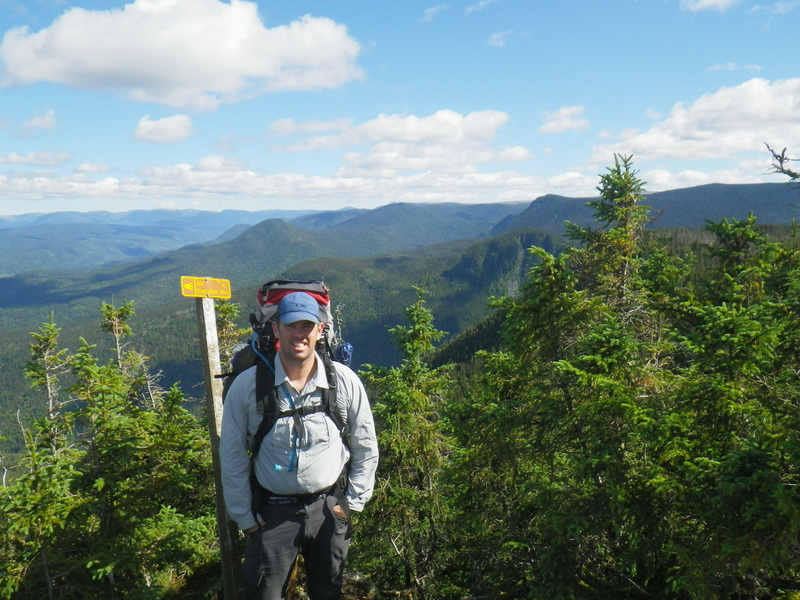 Our plan was to backpack for 4 days, camping and exploring Gaspesie National Park. 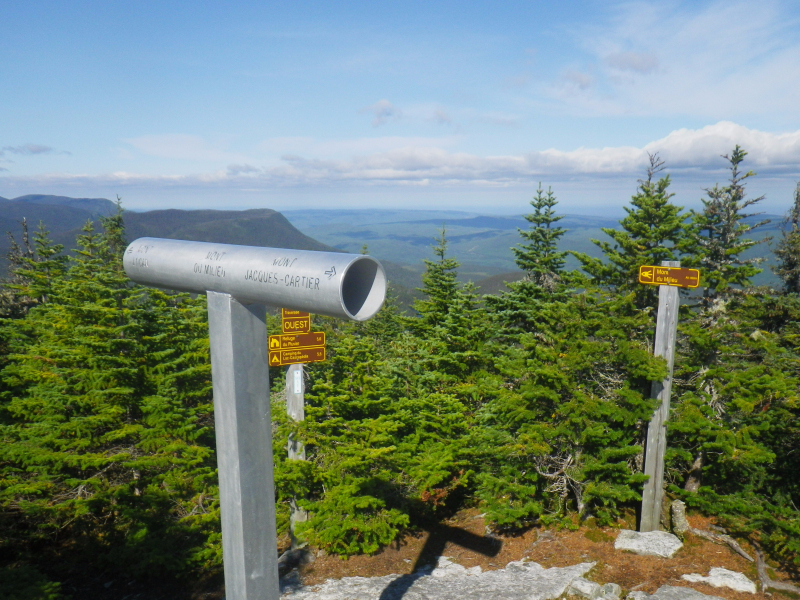 The trail we were following is part of the International Appalachian Trail (IAT or SIA (Francais)), which officially travels from the US through Quebec, Newfoundland and even parts of Europe. 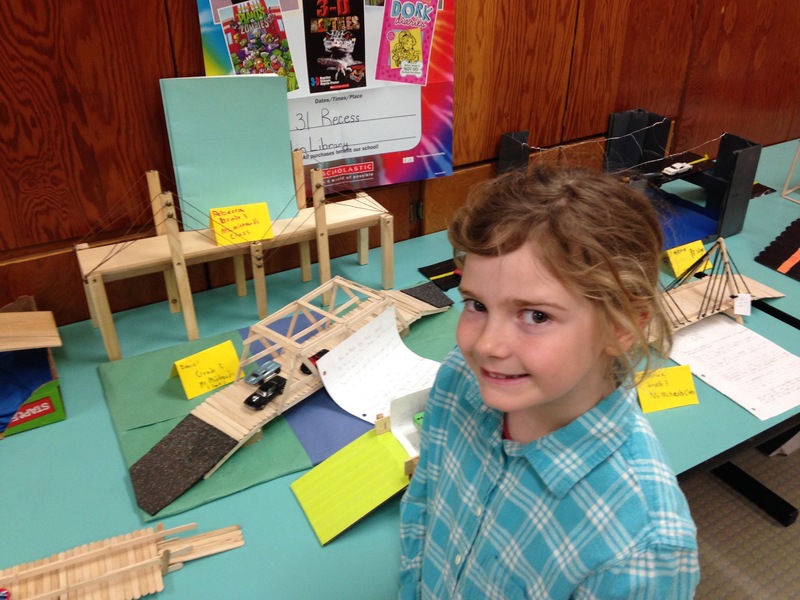 (Of note, the association recently met in Mabou, NS to discuss further expansion of the IAT trail. Including the proposed Seawall trail, taking a similar route to our 2013 hike). 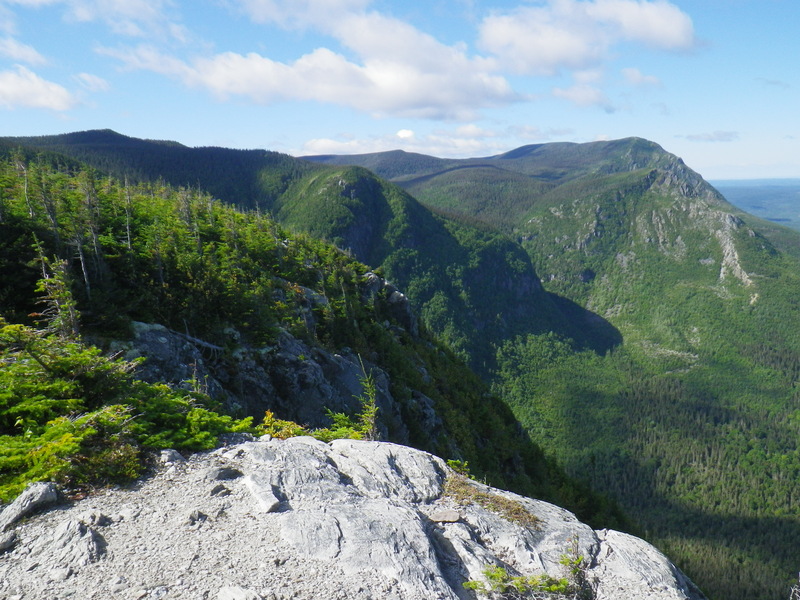 The Gaspe portion was featured in National Geographic as one of the top 20 hikes in the world. 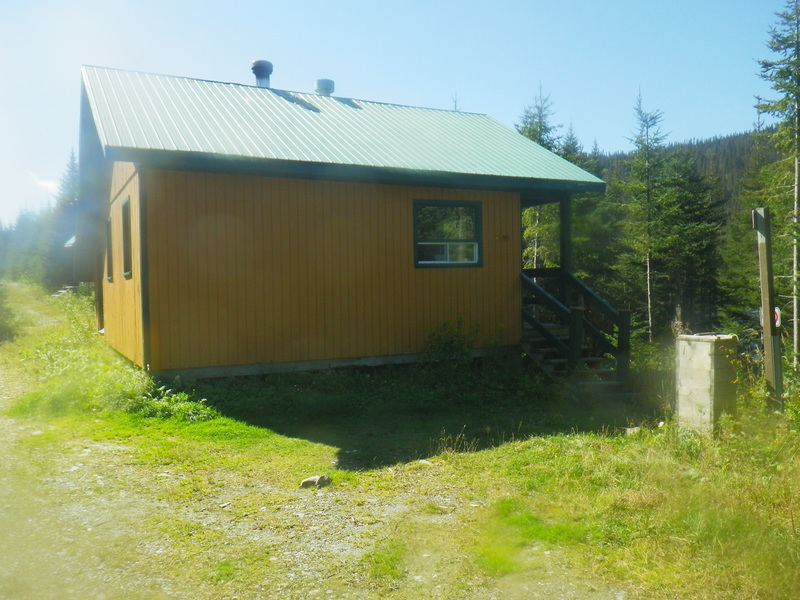 I had my first experience at the park back in 2003 when Sheena and I arrived at Gaspesie to camp for our honeymoon. At that time in June, we were impressed by the 'rocky type' mountains and found out that the snow was still deep in the mountains despite being late spring. This year with Kris and Matt, our plan was to hike from the western section of the park starting midway at 'La Huard' and continue to the Mt. Albert campground which is mid-park. 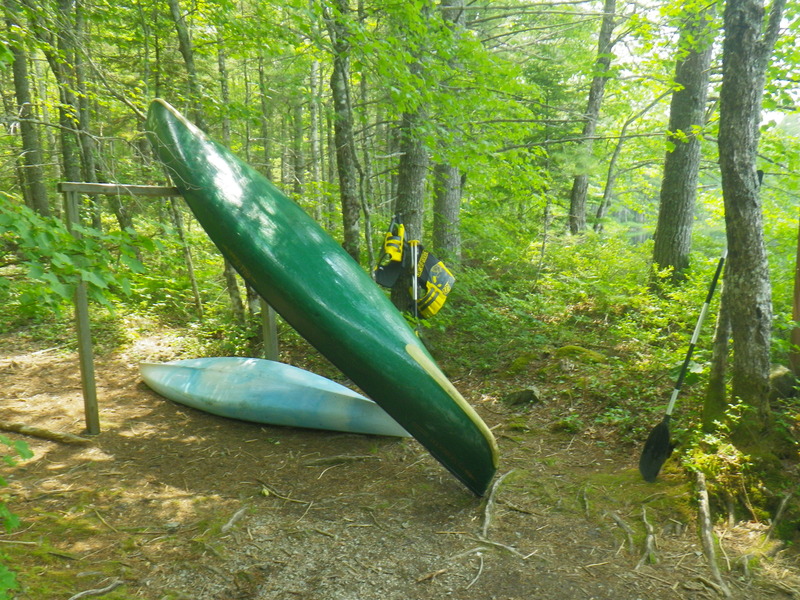 This involved daily sections of trail with varying kilometre distances: La Huard to La Soule, 12.6k; La Saule to Cascapedia, 12.4k; Cascapedia to La Fougere, 15k; Fougere to Mt. Albert campground(19k). The last day involves crossing and descending from Mt. Albert, a challenge in itself. 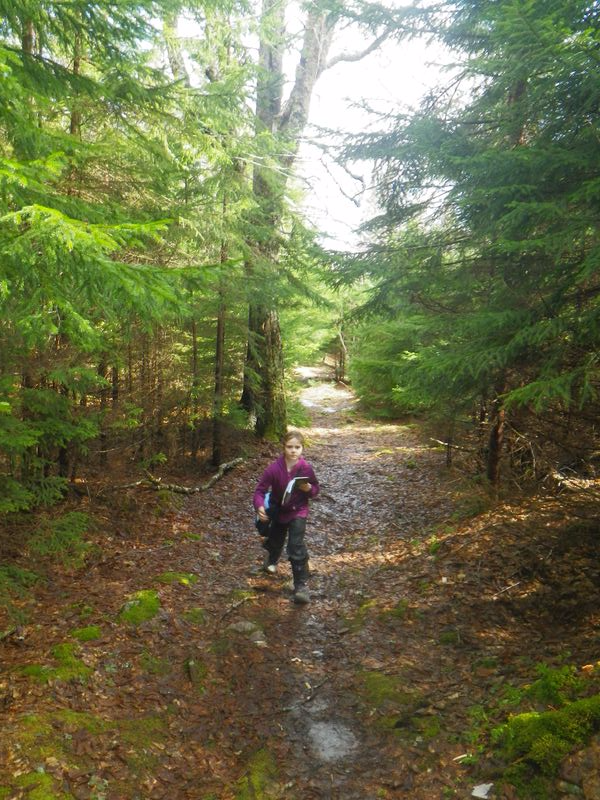 Here's a Map of the Gaspesie portion of the SIA Backpacking trail. A shuttle is available from the Mont Albert visitor's centre at 9am. 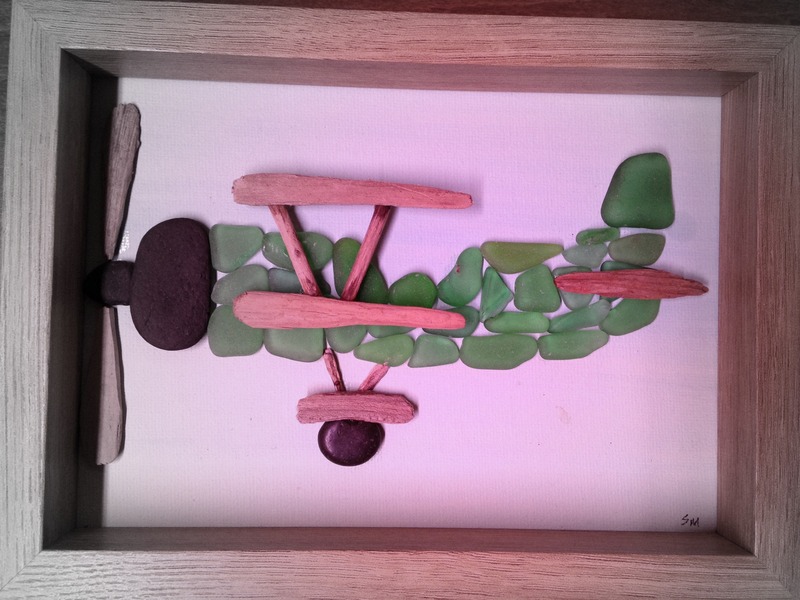 Of interest, the shuttle does runs to the Mt. Logan sector and takes roads normally closed to the public and as such access can be gained to the more remote sections of the park. If we had time and energy, I also hoped to hike to Mt. Jacques Cartier from Mt. 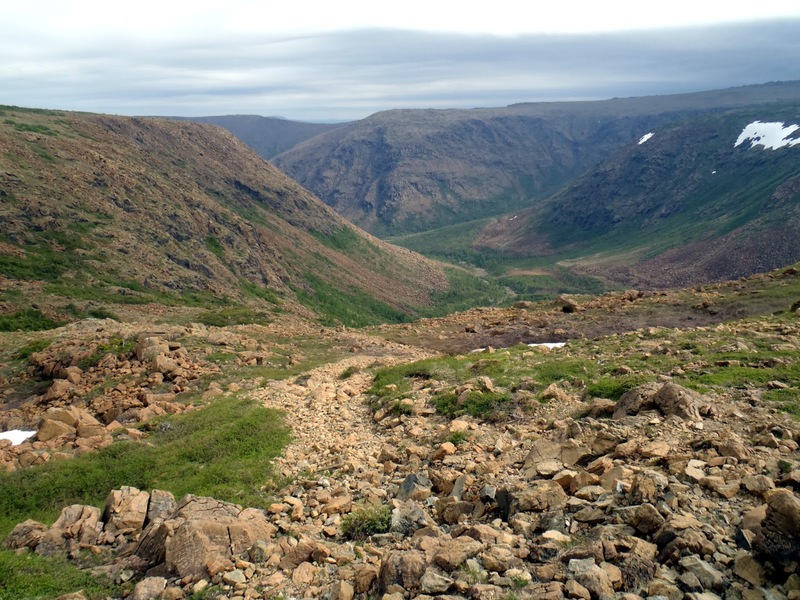 Albert campground, as it is the highest point in southern Quebec at 1268 m. (The Torngat Mountains in Northern Quebec have the highest mountain, Mt Caubvick). That would involve a 25k return trip in addition to the approximate 60 kms backpacking. In general, if a person didn't want to backpack, the park is set up so the Mt. Albert campground could be used as a basecamp for day trips to the various sectors of the park. 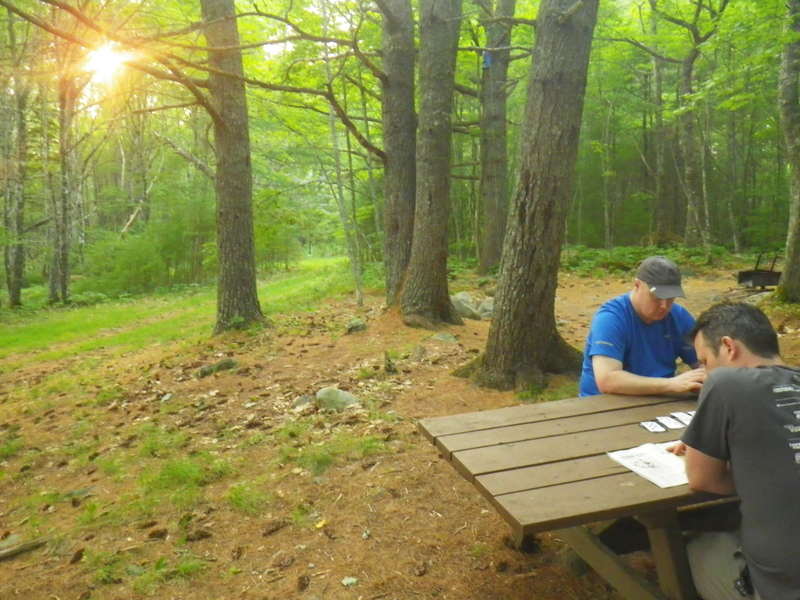 As well, we planned to stay at campgrounds/tent sites, but it is interesting to note that each area has a Hut/Shelter which hikers can also stay at. 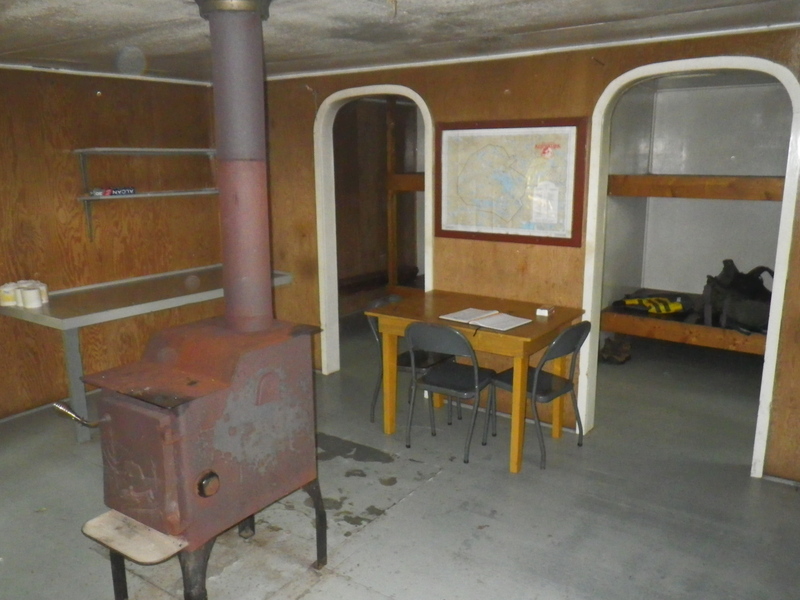 They have well built bunk beds, wood stoves, firewood, kitchen areas and bathrooms. We found these were very well kept and maintained and wished we could have stayed in them ourselves! 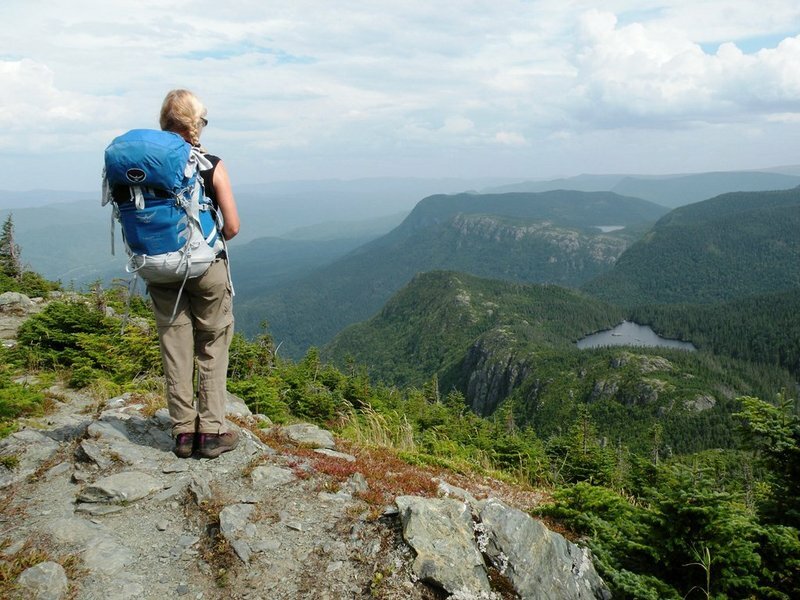 Gaspesie National Park is one of Quebec's 'provincial' parks, held to the standards of any National Park found in Canada. 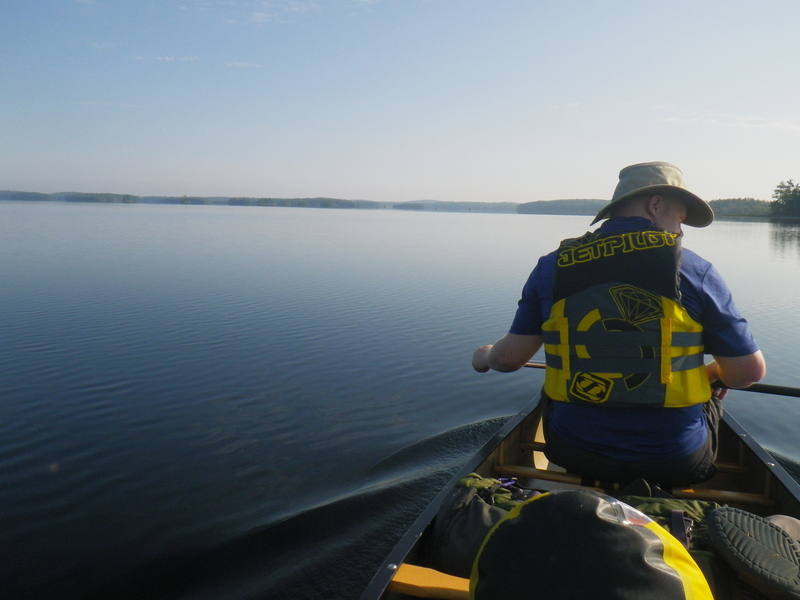 I have recently been very impressed with the province's emphasis on outdoors activities. Passing through Quebec highways you can see it displayed in the provincial rest stops, picnic areas and quality services and facilities offered in the parks. Despite a difference in language, the park employees were welcoming and made every effort to ensure our stay was a good one. Our hiking trip started off ominously with thundershowers and heavy rain as well rode in the shuttle toward our trailhead. Looking into the mountains as we approached them, the sky was almost black, despite that it was ten in the morning. As lightning flashed on our windy trip up into the mountain, I hoped the electrical storm would pass far away from us before we began our ascent. During our drive, the driver stopped to check on two hikers who were taking the road in the downpour. They related a story in French about having left the hut 'La Mesange' this morning, deciding to descend from the hills for safety in the storm. This weighed in my mind as we kept going up into the hills. Thankfully, the thunderstorm had passed over us before leaving the shuttle and we only had to contend with downpouring rain. 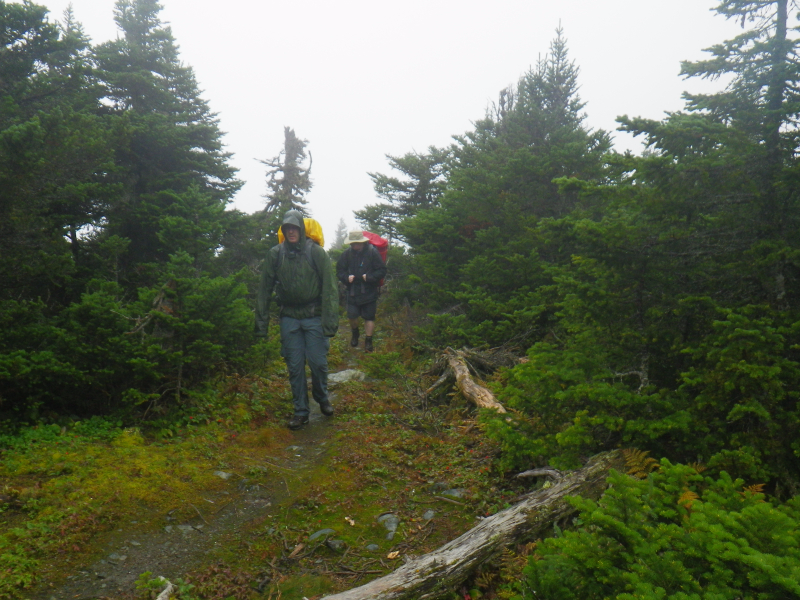 As the rain came down, we climbed upward into the mountains trails. 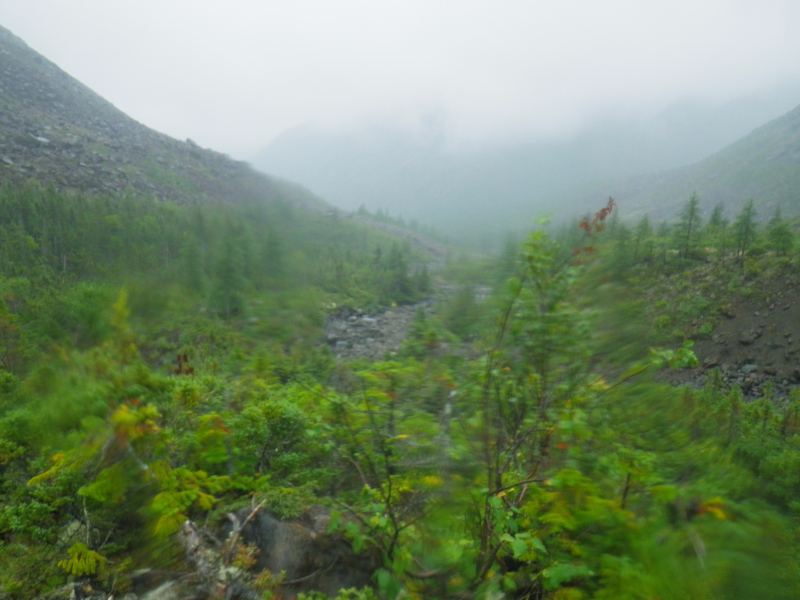 The wind and rain battered us as we travelled through the forest and along the ridge tops of Mt. Arthur-Allen and Mt. Blizzard and finally the Pic de l'Aube. We were obviously missing lots of views with the nasty weather. The photo to the right is one view we saw, but I've attached a link to what you could see without clouds during the day. We travelled until around 2 pm, when we took a short side adventure in an attempt to dry off and stopped at the hut, La Mesange (below left). To us, the hut might as well have been a hotel room. 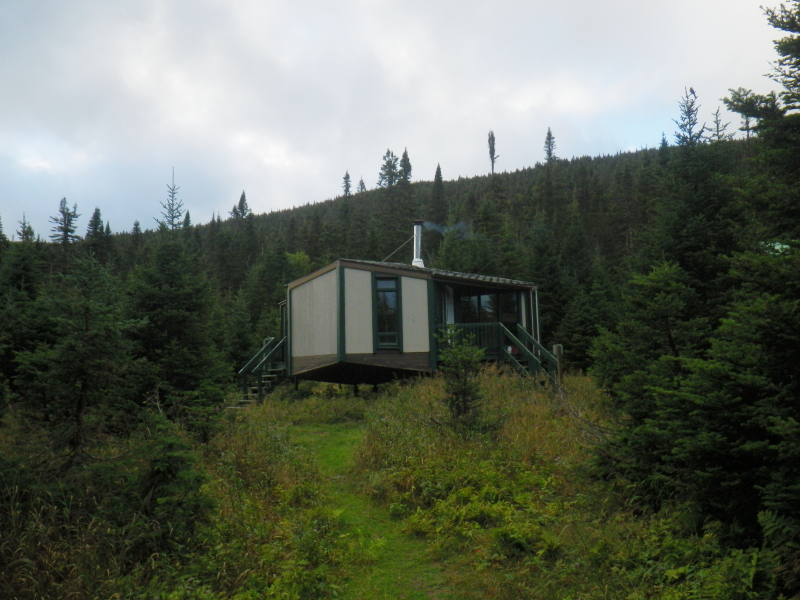 With a wood stove, mattresses in the bunk beds, a dining room table and chairs, even split firewood, it was a joy on a wet day. We spent several hours in the hut pondering whether to stay or leave the warmth for a tent. 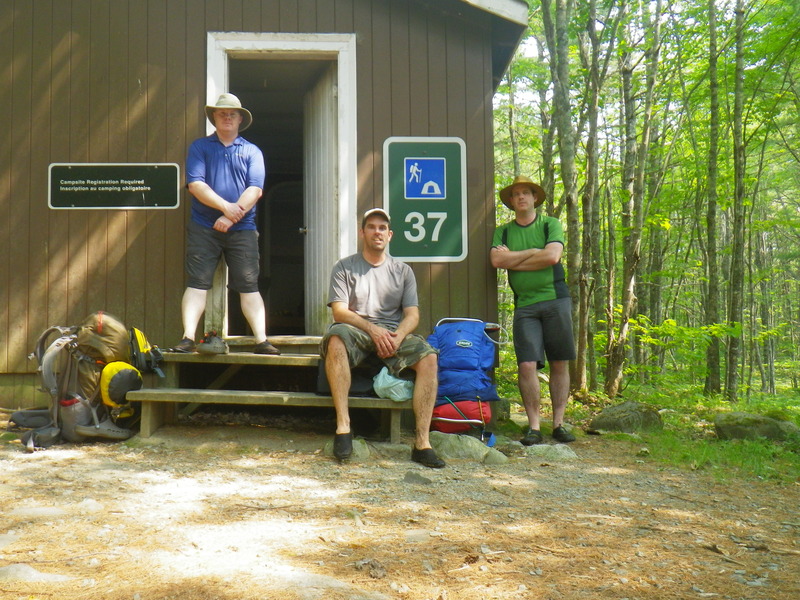 Eventually, other hikers had arrived and we decided to keep our original plans to stay at the tent campground at La Soule. Thankfully, we did have a chance to warm up and dry off. We would later learn that you can stay at the huts on a 'per bed' basis, but we didn't know this and didn't want to disturb anyone's reservation. 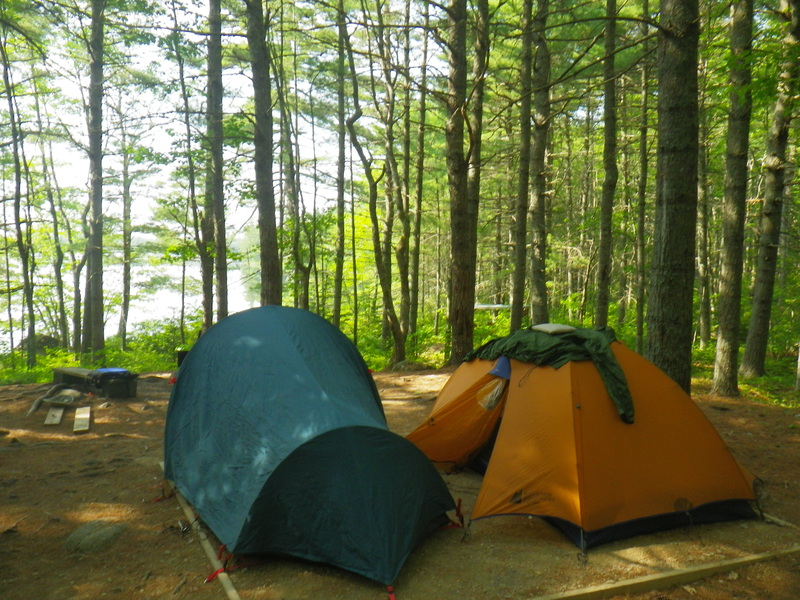 At our campsite, the wind howled through the trees all night and we woke to a chilly but sunny morning. Above is the empty tent pad we used to eat our food on and have our morning warm drinks. I think all of us were realizing that staying in a hut would have been a welcomed luxury! Because of the clear weather, we now were able to have a taste of some of the views to be experienced in the park. 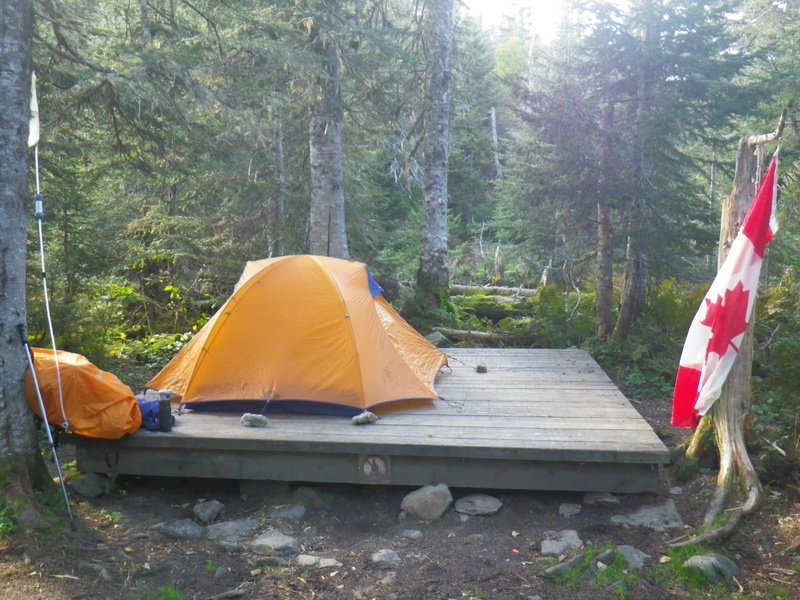 We began our approximate 13 k trek to Cascapedia campground early in the morning as usual. 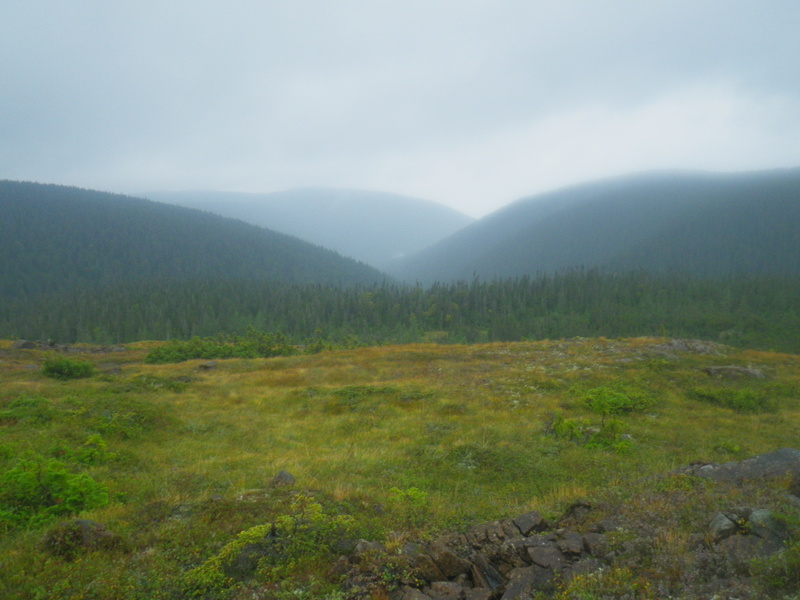 The below photo was taken amid very strong wind of the mountains around the Pic a Brule area. From here, the sky was so clear you could easily see the Bay of St. Lawrence and the other side of Quebec leading to Labrador. The trail skirted the edges in these areas, but was well away from any cliffs. The wind was very strong any time you left the trees. Because the trail kept to the ridges, travel was somewhat easier during most of the day as the elevation changes were at a minimum. 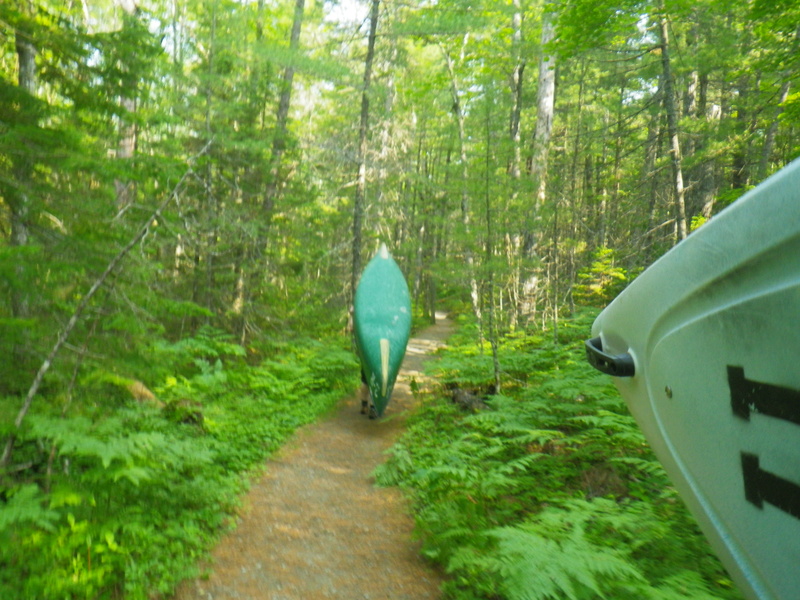 Although, what also came with that was at the beginning of the day usually involved an ascent from the campground after breakfast and long descent to get to supper! Our quads and knees were thankful for the rest at the end of each day. The photo below is at Mt. Ernest Menard (850m), with the camera looking off toward the eastern sections of the park. For our second night, we stayed with permission at the closed campground at Cascapedia which was our 'halfway point' and enjoyed the closed off picnic shelter. We were pleased to have warm water at the campsite washroom for a little cleanup — something we normally aren't expecting on our backpacking trips. 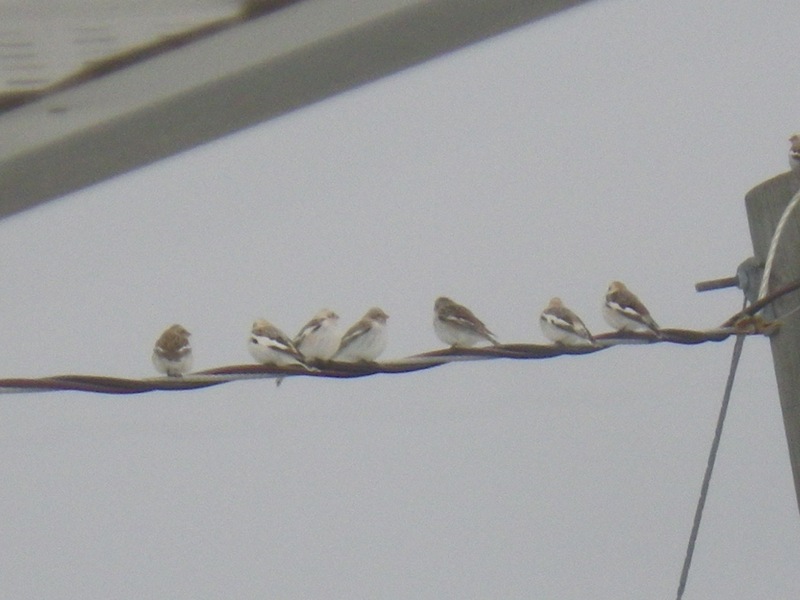 The evening did bring some discussion on our next plan of attack for the rest of the park. 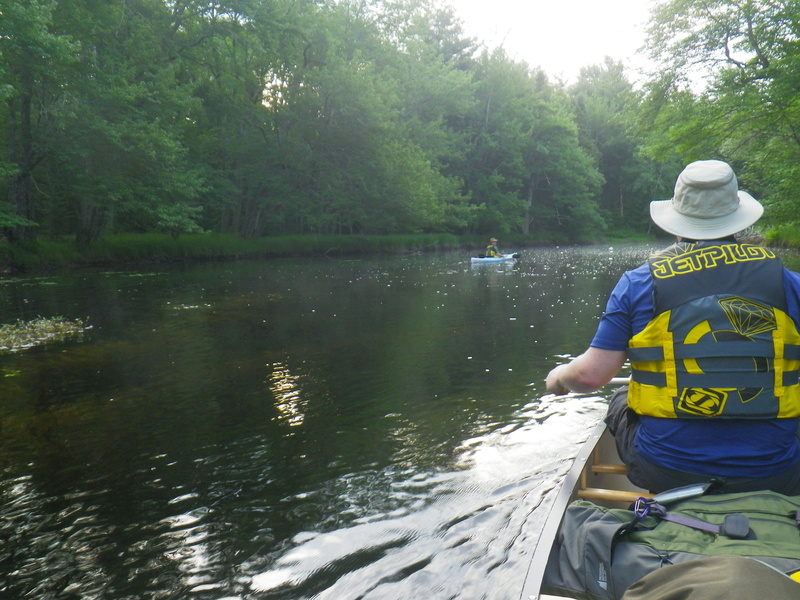 Because of issues beyond our control, Kris and Matt decided to head back to the Mt. Albert campground via the connecting road and I decided to continue on via the trail for the planned two more days. We planned to meet at the Mt. Albert campground leaving my car in the parking lot with the location of their campsite in the campground. That's the plan that we started with anyway! Day three involved some steep uphill climbing from Cascapedia. The first ascent was Mt. Ells, which was 2.7k of steady uphill. It provided the first views of Mt. Albert's back side (above left). I would need to ascend that mountain from roughly the area pictured in the far distance. The days weather was clear again and seeing that I was up high, I decided to check for cell reception. 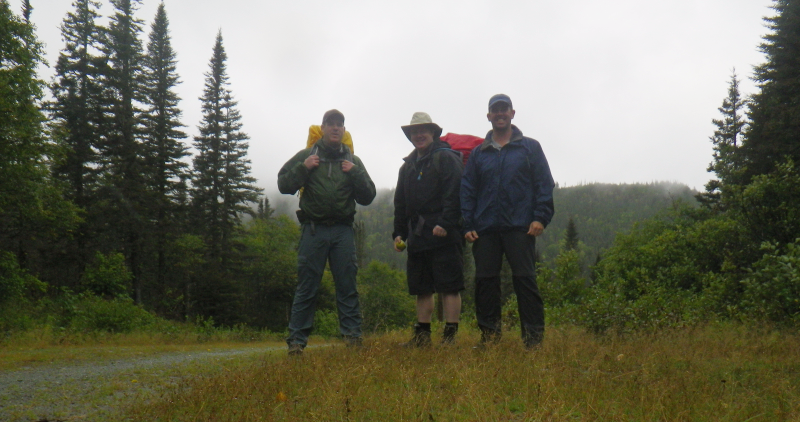 I found good cell reception and confirmed via the Environment Canada website for the park (again a new experience while backpacking) that there was quite a bit of rain coming the following day for my trip over Mt. Albert. Keeping this in the back of my mind for the whole day, I continued across the ridges to Mt. Milieu (above right). This mountain is in between Mt. Logan and Mt Jacques Cartier, which are situated at either ends of the park. A neat monument is placed there, which I assume points to either mountain. Following Mt. Milieu, it was a steady decline for almost a couple of hours to the hut at La Pauline. La Pauline was a nice spot, and I was thinking it was too bad it wasn't farther in the woods to time a return trip to the Mt. Albert Campground. It had a nice deck to sit on, which beautifully overlooked Lac Hayman. Water was available from a spring opposite the shelter as well. However, starting from La Pauline in the morning would involve more than 23 kilometres to the end, likely in the rain. 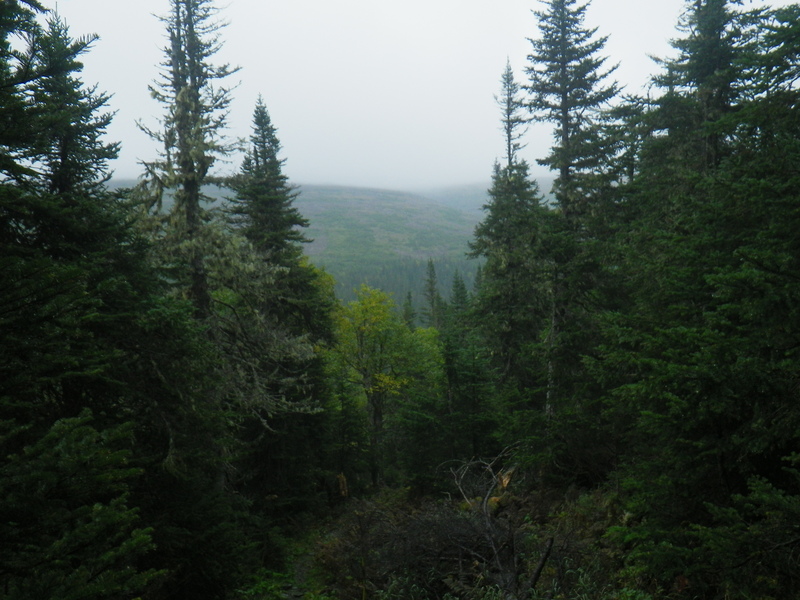 Around noon time, I left the shelter and continued along the trail to La Fougere campsite. Walking the 3.6 kms between the hut and the campsite, I was feeling the heat of the day (impressive for September) and the previous ascents and descents as well. Then, to round off my concerns for the next day's on-coming weather, I began to see many bear tracks along the trail to my campsite. It was later in the day (1pm) and, I knew I had to stay at La Fougere for the night as the kilometres to travel was too far to make it in less than half a day to the next shelter. 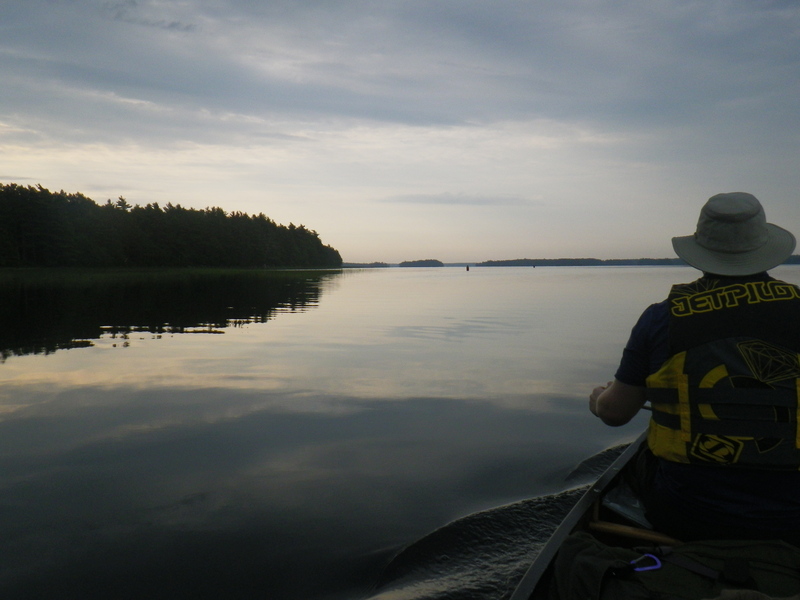 Darkness was a consideration, because in these mountains, the evening light fades quickly after 6pm. So knowing had I to stay, I set my campsite up early in the afternoon and found more cell service (surprised) on the highest tent pad. Looking at the map, La Fougere campsite is really in the middle of nowhere! Its a 13 to 20 km hike in either direction. As I had seen the bear tracks and the expecting rain, scheduled to start sometime over night, I was taking the usual precautions with food and good coverage for my gear in the rain. In protecting from animal visits, we usually will eat our meals away from our tent site, typically on a second tent pad a distance away. We also raise our food off the ground in some way for safe keeping. 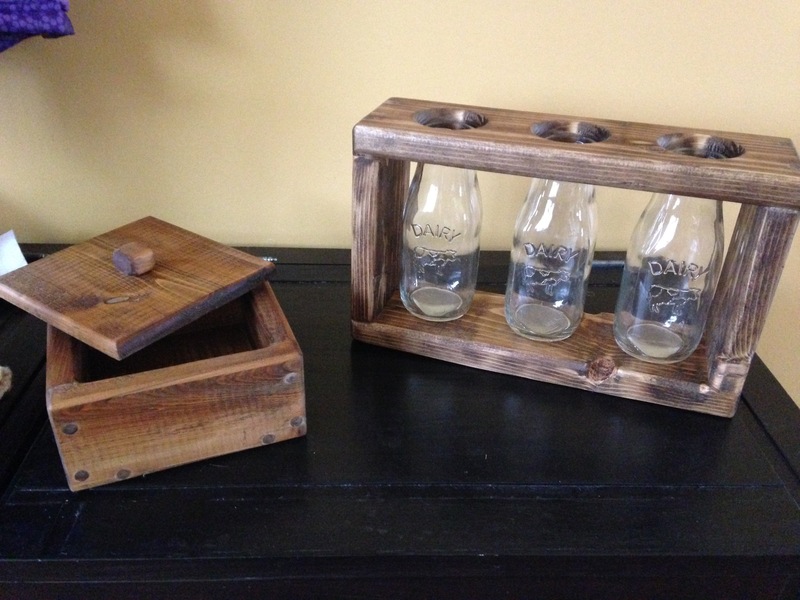 I borrowed an idea from Kris and stored my food … in the outhouse to keep it safe and dry. 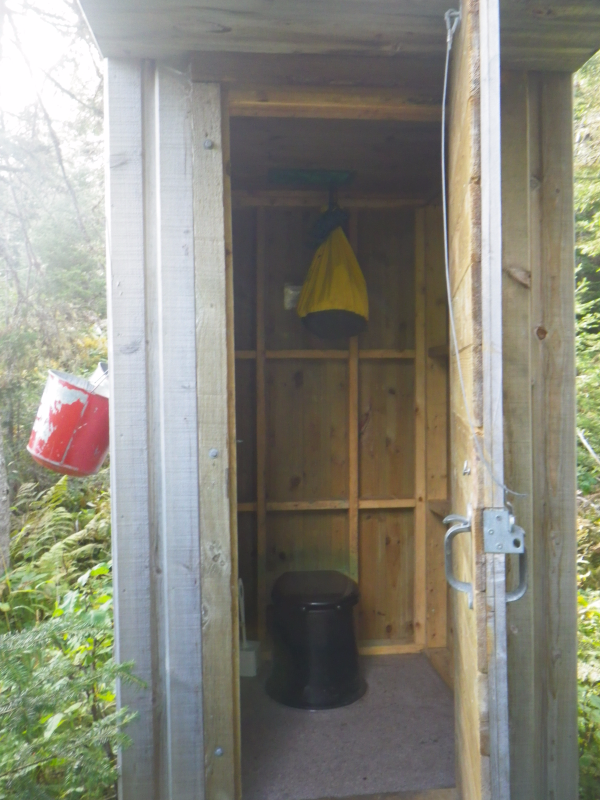 In my defence, it was likely the cleanest and freshest outhouse I had ever found – and nevertheless hung my food with the seat down(!). I spent the evening prepping my gear for the next morning, which I wanted to have an early start. After a long night of waking up to the rain pattering and at pretty near every 'loud' sound in the woods, I started off breaking down camp with a hint of daylight at 455am. Getting my water filtered and pack squared away, I started on the trail at just before 6 am. I began the roughly 19-20 kms of the day's travel for 7 kms in the quietest forest I've ever hiked, which eventually lead to the approach to Mt. Albert. In case you were wondering, the rain started in the 1st kilometre and began with a pleasant drizzle, eventually greeting me with an hour's long downpour. The rain never really stopped throughout the day and to put it in my daughter's terms, my pack cover was 'pretty well useless' at that point. Just before arriving at the Mt. Albert approach, there is a somewhat disheartening downclimb to the Grande Fosse brook (below left). Once above the treeline, I looked back to where I travelled through the quiet forest valley from La Fougere (below right). The rain and thick fog was consistent for my travel across the back of Mt. Albert. 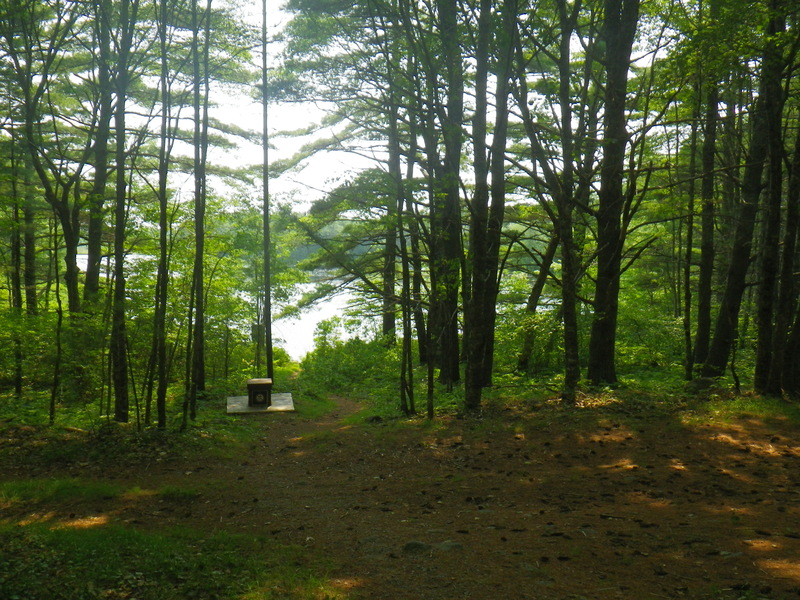 I spent most of my time keeping my eyes on the white wooden trail markers and cairns [Kris!] which are spaced fairly close together, for reasons I was now keenly aware of (see below photo at left). Although due to the tight restrictions at the park for off-trail travel and the fact that it is the IAT (SIA), there really is only one fairly worn trail, so route-finding was easy as long as you pay attention. Where the travel became most challenging was the long (and terrible in the rain) descent from the plateau. 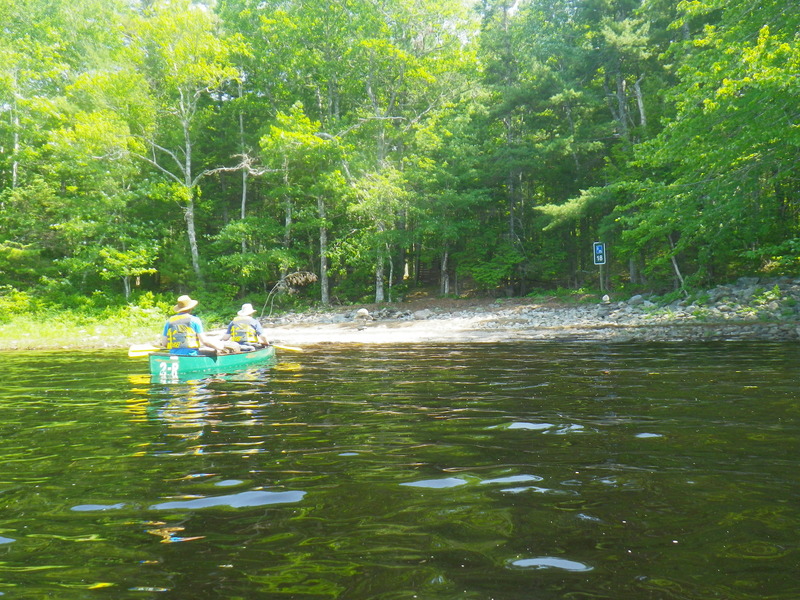 It began with a steady crossing of a boulder field, well marked with the iconic IAT red and white markings on the rocks. I was quite thankful for these markings as well. These wet boulders were challenging to navigate with a backpack and I took great care to ensure I didn't fall in the deep holes between them. One other factor I was glad about on the rainy day was that the textured composition of the brown type rocks so prominent on Mt. Albert, which made gripping them much easier. I knew that with all the fog and rain, I was missing probably some of the nicest views of the trip, especially given that it was above the tree-line. Here's another photo showing what I was missing! The descent trail follows a long (I mean LONG) rocky valley where the 'Ruisseau du Diable' begins its flow. As I climbed down the trail, going from rock to rock so I didn't go ankle deep in water due to the accumulating puddles, I was reflecting on the name of the valley and finding it was well suited to describe the travel as 'Devils river' valley. The water was now flowing over each drop in the trail like its own waterfall and I was drenched to the bone. Gladly, there was little to no wind. I decided to keep hiking without breaks to stay warm and didn't dare take my backpack off. I kept my right arm tight against my body to stay warm as the temperature was likely 7-8C on the mountain. (Yes, it was getting to be that type of hike!). Passing by the Serpentine Hut was difficult, but I knew I would just get wet again if I did try and stop knowing that the down pouring rain was inevitable and its true escape was a dry change of clothes at the car. It was also hard to take pictures and keep water off my lens. 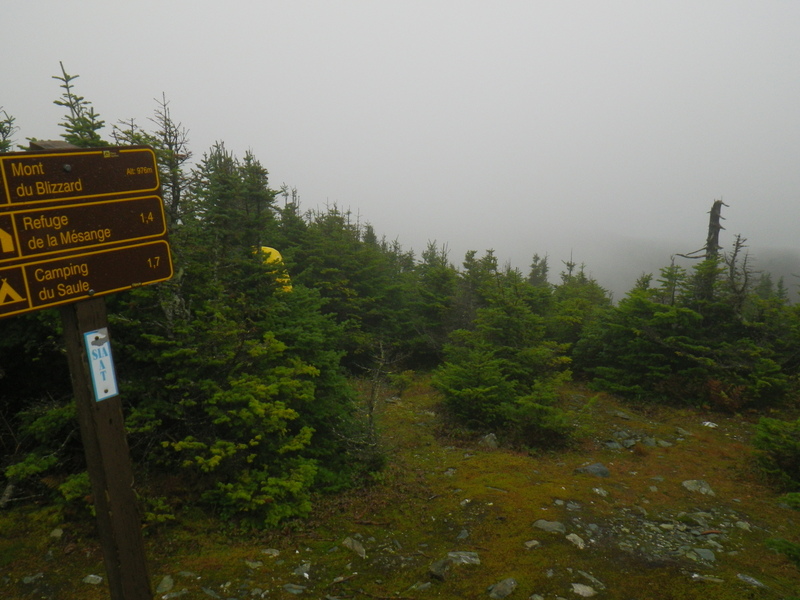 When I did reach a point where the fog and clouds lifted enough to see, I was near the junction with the summit trail (See below left). I found that the descent trail continues with rocks, roots or other obstacles just until reaching the actual Devil's Falls area, about 3 kilometres from the visitor's centre. I stopped to take some quick photos of les Chutes du Diable (Devil's Falls), but kept going to stay warm. I was very surprised to see the trail completely under water at Devils Lake (Lac du Diable) — which had been detoured into the woods for about 500m of bushwacking with ribbon tape marking the trails seemingly well prior to today's weather. After nearly 6 hours of travel, I pushed through the rain and cold and arrived at the visitors centre around 11:30 am. The denouement story is I arrived there to find no car. I immediately thought that Kris and Matt likely did not expect me to arrive this early and walked into the visitor's centre to inquire about their campsite. Trying to speak in French while creating a puddle on the floor at the visitors desk, I learned they had rented a hut for the night (thanks guys!! ), but it was 2 km back where I came from. Thankful but clearly done with the kilometres for the day after already travelling 20+, I headed back to the huts — again in the rain. I arrived there, but could not find my car and decided to set up in an empty hut as I wanted to get dry. Unbeknownst to me, Kris and Matt had changed their reservation again to a more private 'O-Tentik' (luxury!!) type shelter and I later found them after making a quick walk around in the campground in semi-dry clothes. To their immediate credit, they retrieved my gear left at the last hut and greeted me with drinks and chocolate, as well as a great place to warm up. We spent the following few hours catching up on our adventures and reflecting on how lately each of our trips seems to end in a different way ! The afternoon and evening had lots of laughs, and enjoying the 'glamping' and a shared a rare event, glasses of craft beer over supper. 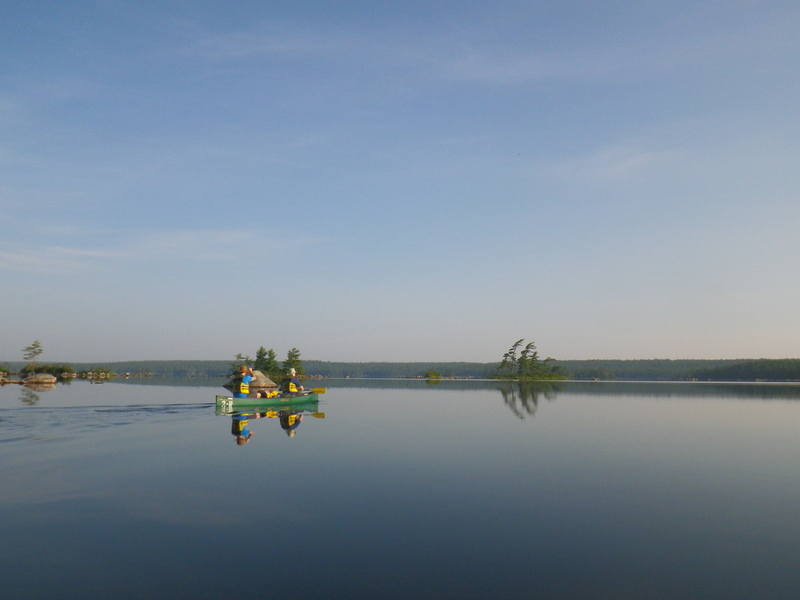 I was a bit sore after the last day and decided against heading to Jacques Cartier the following day. 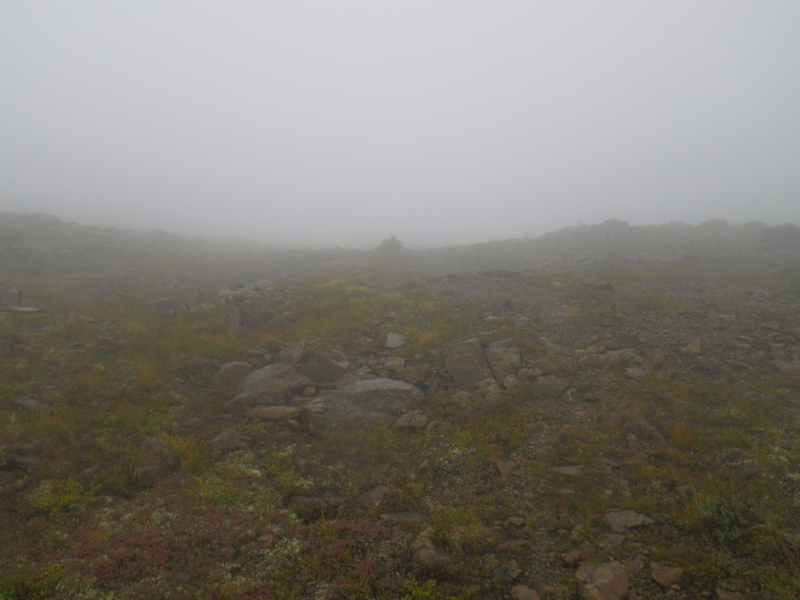 (Plus, there was more low cloud making views almost non-existent.) It will however give me another reason to head back to Gaspesie Park. On the road back, we stopped in Carleton-Sur-Mer for the craft brew spot 'Microbrasserie Le Naufrageur'. In the following days, I was quite impressed by their beer — which definitely rivals our local Picaroon's for smoothness and taste! 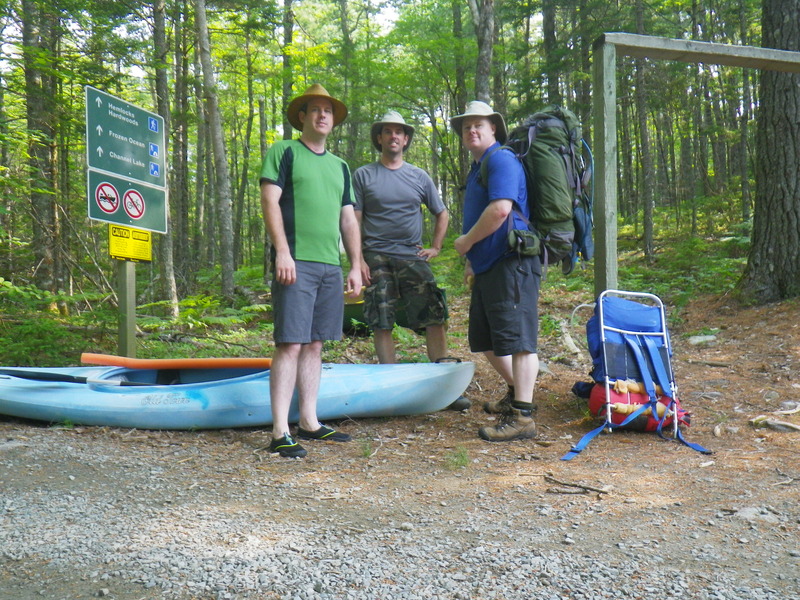 Thanks Kris and Matt for another great trip — and to Matt for enduring the lovely NB roads. 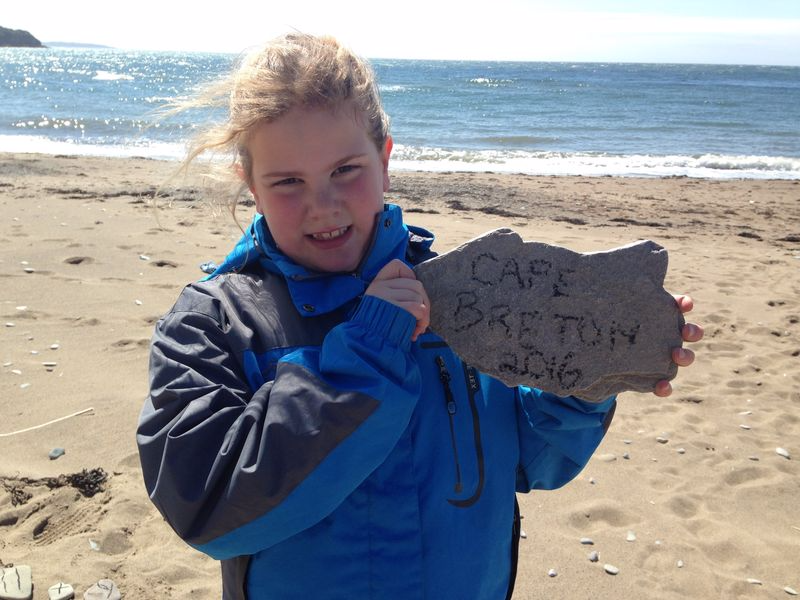 Our last weekend in April was spent on a spring trip to home in Cape Breton for a long awaited visit. 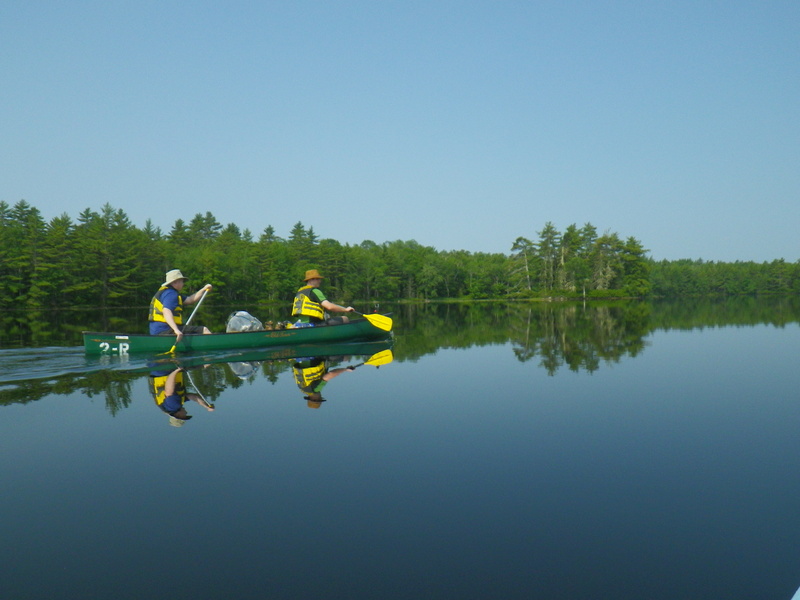 We had wonderful weather for our trip, which allowed us to do some hiking, beach walking and fishing. 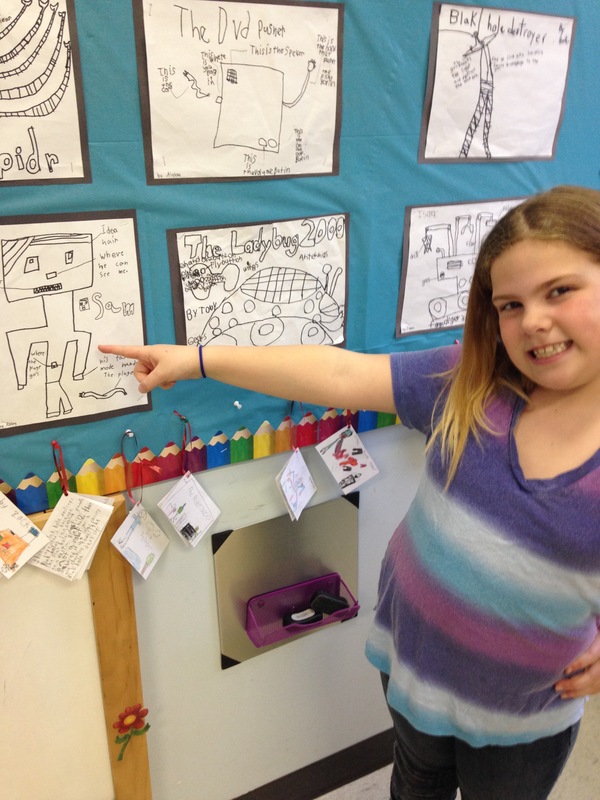 The above photo is Abby holding up her intro rock to our trip and her photo slide show. 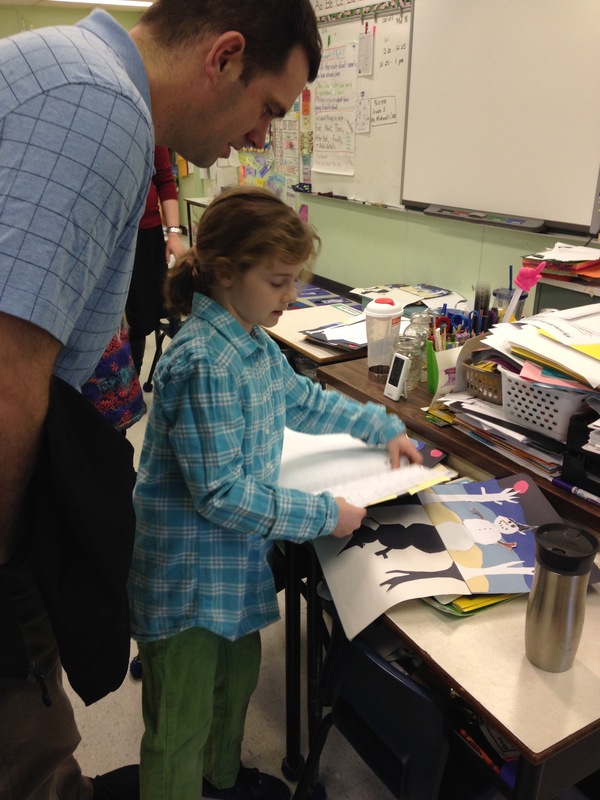 She was very excited to compile a number of photographs for her class to see where she had been and what she had done while she was away. This became a common discussion throughout our time away! 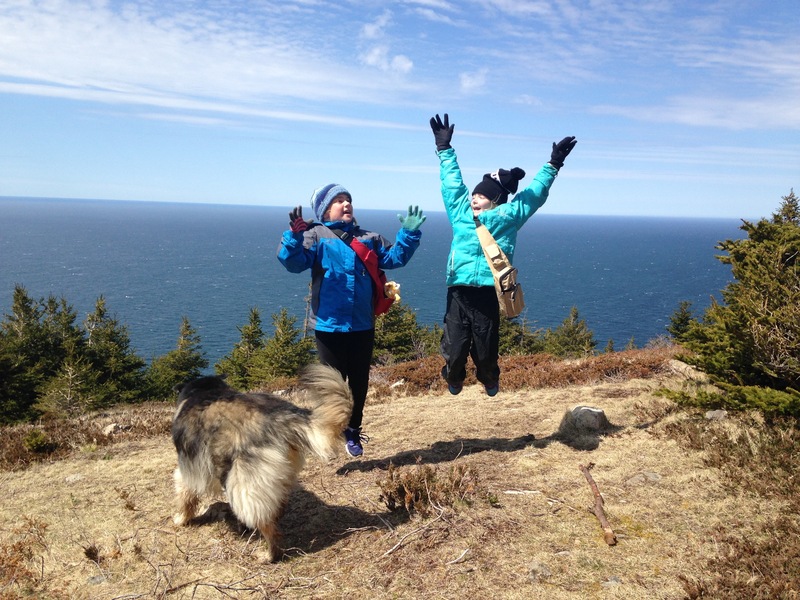 Our hike took us to the MacKinnon's Brook trail in the Cape Mabou Highlands. It was a crisp day, but great weather for hiking. 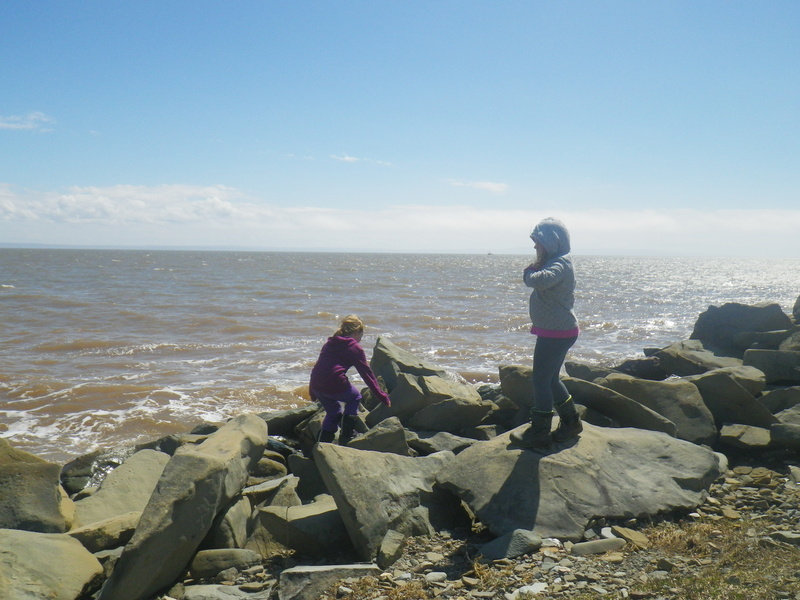 We took the kids the 1.5k uphill to the look-off of the Northumberland Strait. PEI was visible from our perch above the ocean. 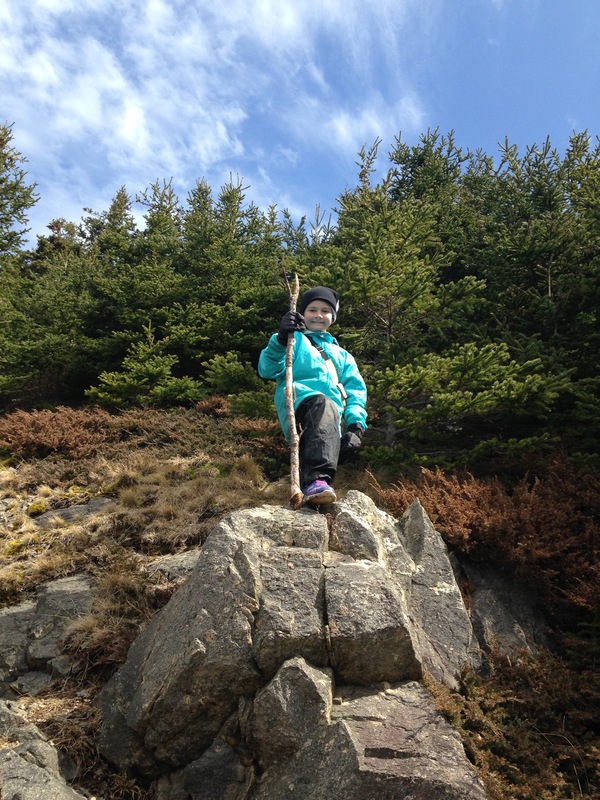 Here's Rebecca with her newly found hiking stick. The path to the look-off leads to a nice clearing and a good spot for lunch. 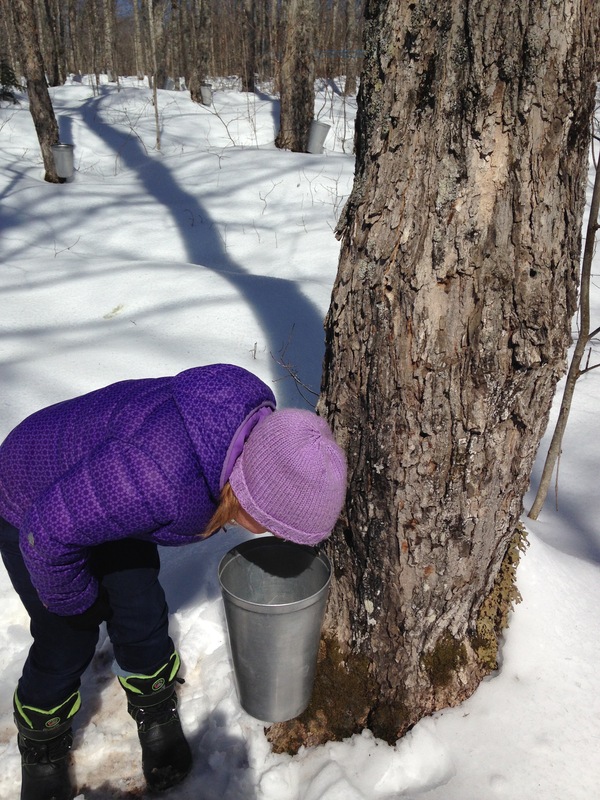 Abby relished in her usual job of caring for Willow along the trail. We love it too, because she keeps the pace going quite well. There was the usual excitement upon arriving at our destination. The timing was slightly off between cameras, but makes it fun playing with angles. We were invited on another day of our visit to see the animals at a neighbour's house. 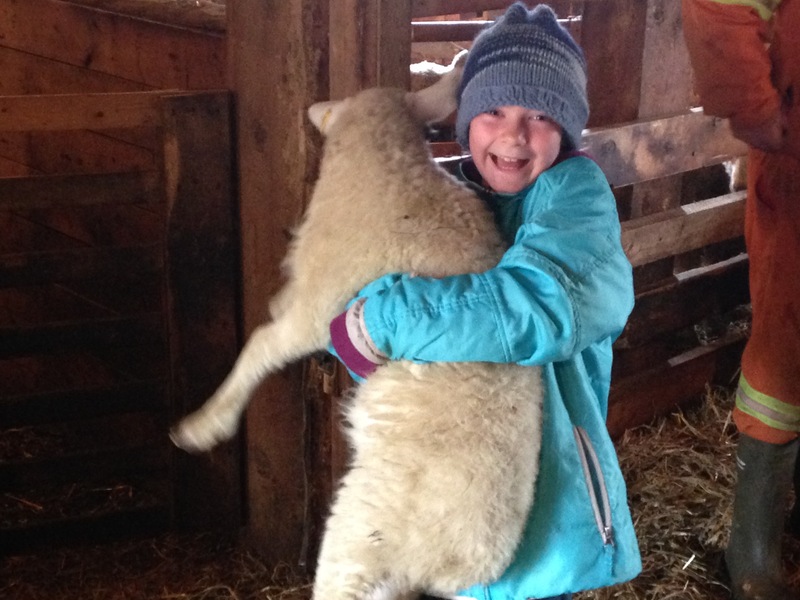 There were quite a few sheep for them to see, chase around and in Rebecca's case, pick up like a cat. There's also a kind horse called 'Flicka' at the farm. 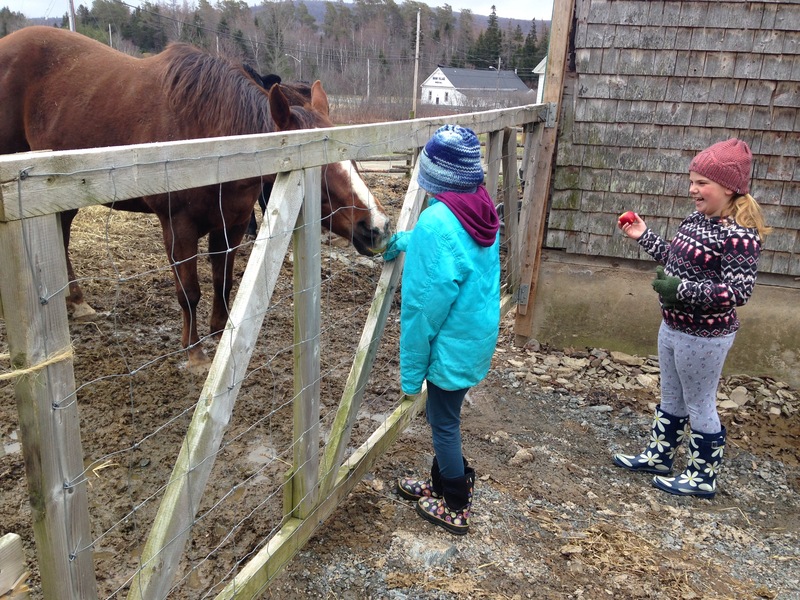 The girls enjoyed giving apples as a treat. They were laughing at the way she reached out with her teeth to pick the apple from their hands. 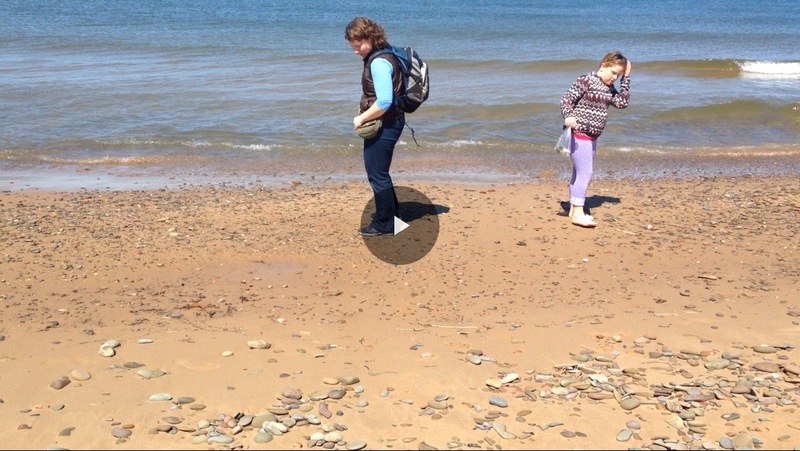 No trip to the Mabou and Inverness area would be complete without a beach walk. 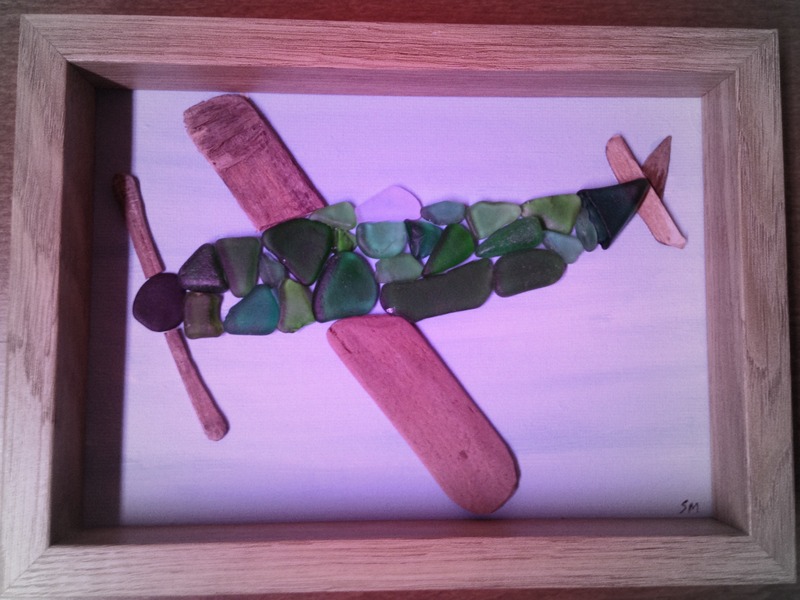 We spent a couple of hours enjoying the sights and also keeping our heads down for sea glass. 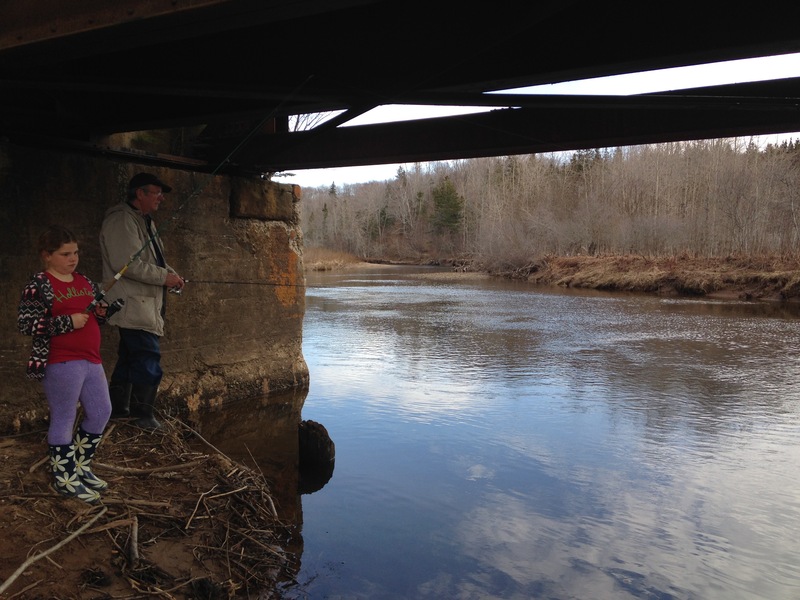 Our Saturday afternoon was planned for a while, specifically to go fishing with Grampa in the Southwest Mabou river area. 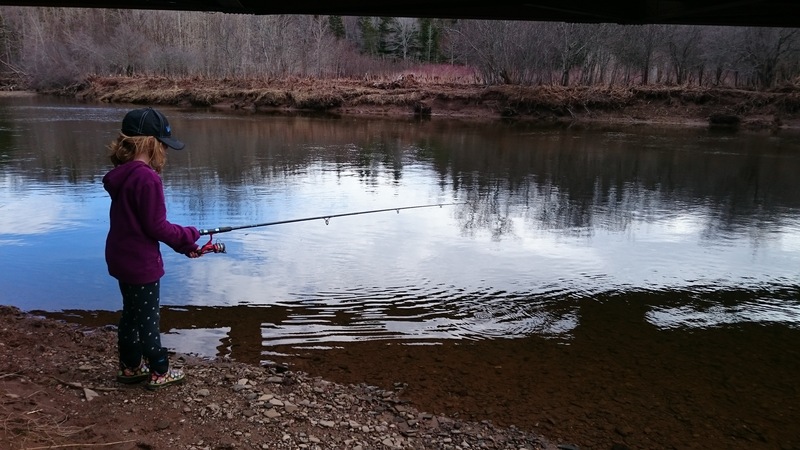 Both girls picked up the casting and fishing very quickly this year. They are certainly growing up fast. 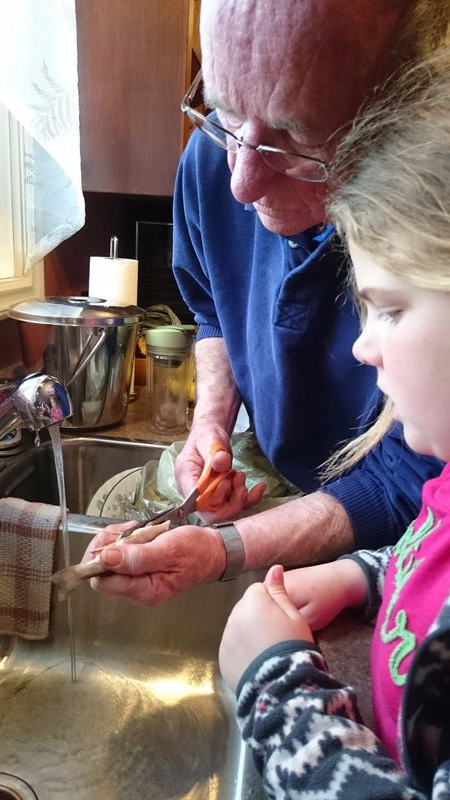 Grampa took home two fish, which Abby really enjoyed cleaning! 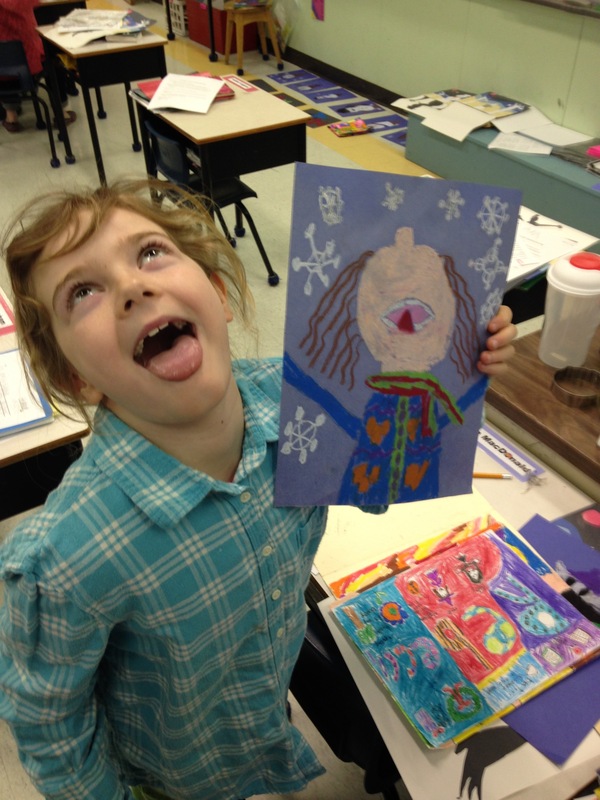 She was so excited and retold the story of how she used scissors to 'cut the fish from the poop hole to the head'. Last but certainly not least, we had a big moment while in Cape Breton. The girls have been listening to East Coast music, noteably fiddle music since they were very young. They've danced around our house, their grandparent's houses and elsewhere. They've heard stories of us going to square dances and listening to fiddle music, but were never able to go because a) they were a bit young and b) they couldn't manage to stay up that late. However, finally, this weekend, we had the chance to bring both of them to the year-round square dancing in West Mabou. 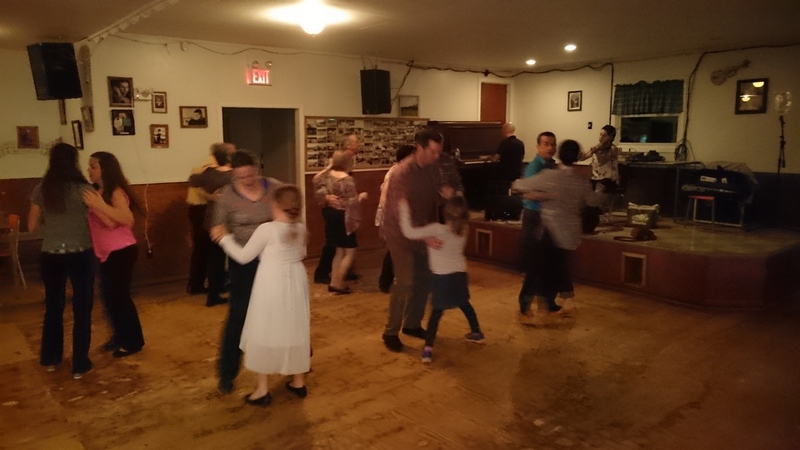 These dances have been going on for decades and although not in the busy season at this time of year, they still provide some fun on a Saturday night. Its a bit hard to take photographs and video in the dimly lit hall, but hopefully you'll get to see the kids at their first dance. I'll never forget the looks of surprise and enjoyment on their faces while they swung around with us and figured it out (ha!). Abby was a trooper and danced three sets (9 figures) while we were there. So much fun yet to be had with these two! 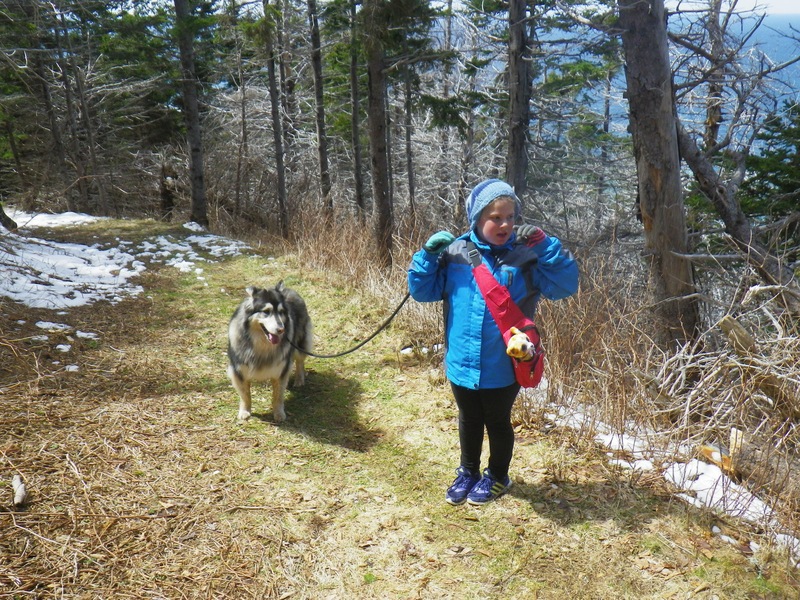 It seems that it was only a few days after the last snow had left our yard and the weather improved above 5 degrees, we headed out to Fundy National Park for our first hike of the year. In passing through the park, we were amazed at how the weather at 366m of elevation still keeps the snow in the woods. This was surprising to us as we have no snow, despite that our house sits around at 300m of elevation. (The snow melting factor must because we are an hour inland with apparently more heat!) Arriving at our first choice, we found the Laverty Road still gated and lots of snow on the road. So, we continued on to our second destination, the Coastal Trail. At the trailhead, we found the weather was cloudy, but eventually turned into a really nice day for hiking with cooler temps around 9C and sunny breaks. We ran into a few others also out enjoying the spring-like weather. Along the way, the girls took their time looking at the surviving plant growth and mosses that lined the rocks and trail. Rebecca walked with a notebook in hand, making notes of what she saw. I peaked over her shoulder at one point to see sketches of the different types of moss she picked up. 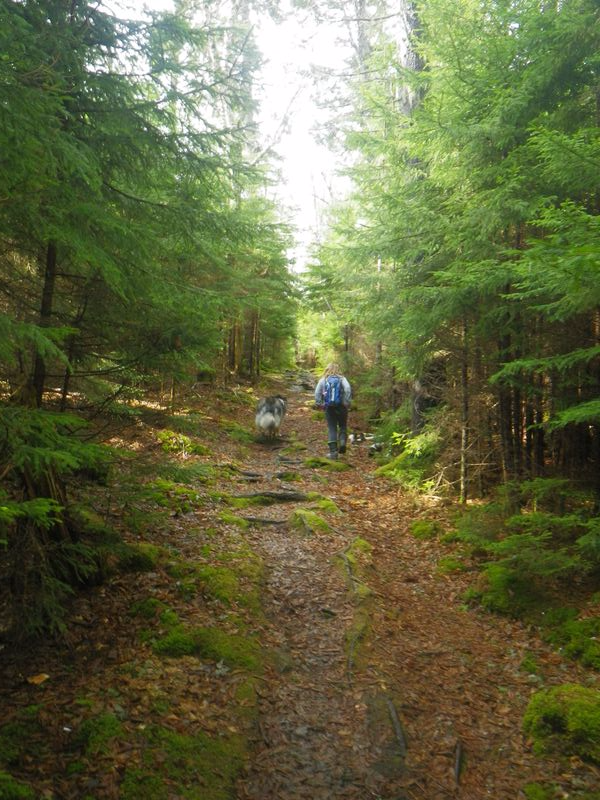 Meanwhile, Abby had Willow well in hand and held the 110lb dog's leash for most of the trip, guiding her through the proper spots and moving her along when she lingered a bit too long on the various scats we encountered along the way. Abby correctly picked out coyote leftovers while passing by. Despite the relatively uphill incline, the girls did really well. We started at the eastern end of the trail by the stone bridge, and in this direction, the trail gradually gets closer to rocky ledges, steep drop offs on the side of the trail and lots of sink holes. We decided to break for lunch and turn around near a great view of the Bay of Fundy and cliffs of the Alma area. 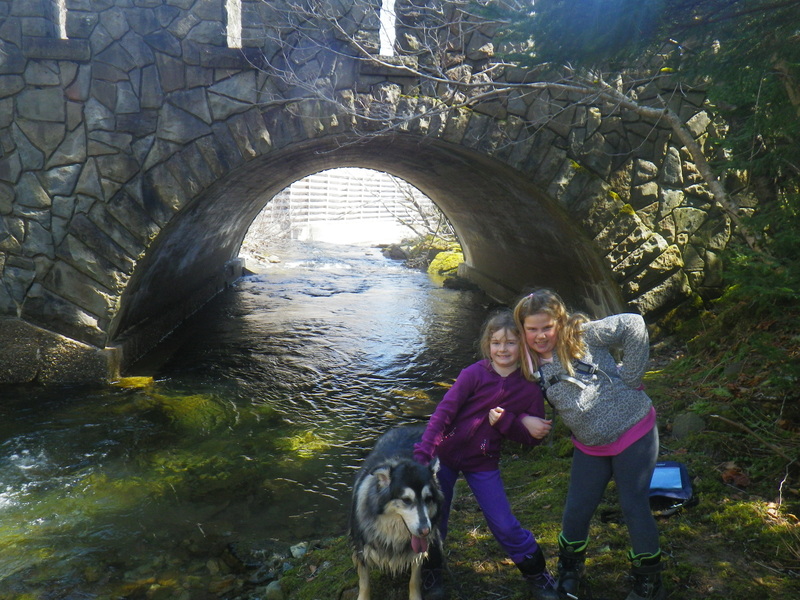 On our return, we checked out under the stone bridge (no trolls) and gave Willow a little swim and drink before moving on. The crystal clear water from Dickson Falls was enticing for maybe a warmer day. Our post hike snack was enjoyed down at the water on the benches near the Bay. We were all surprised to see the gravel and rocks strewn over the parking lot, likely from the storm surge of previous days. The high tide was some of the highest of the year due to the recent storm. Normally there are several feet of clearance between the water and the upper rocks. Despite the wind, we had our obligatory visit to the new and improved playground park at Fundy, as requested by the kids. My fun followed by their fun! 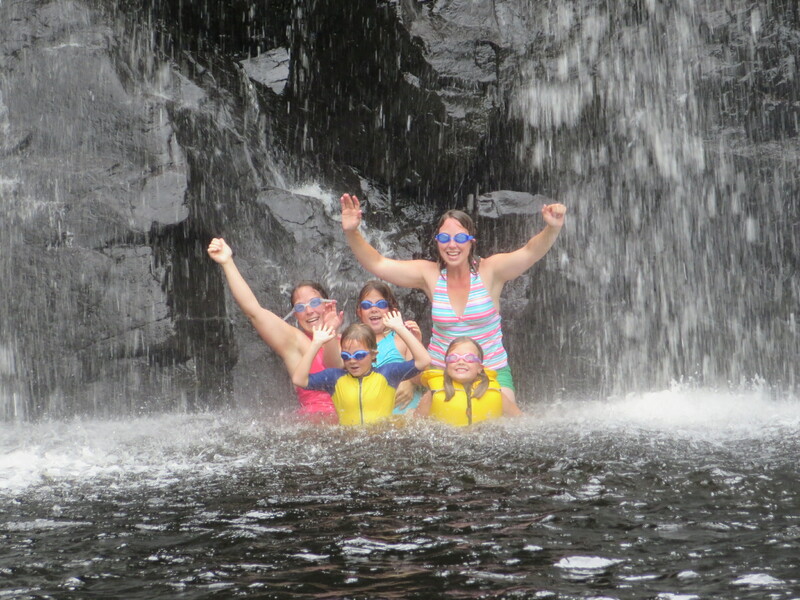 The past few days we've been escaping the heat at two waterfalls in the area, Henderson Falls and Wallace Falls. Both are quite different from each other, but have their own types of fun. The first day of three, we headed to Wallace Falls and enjoyed the warm water. 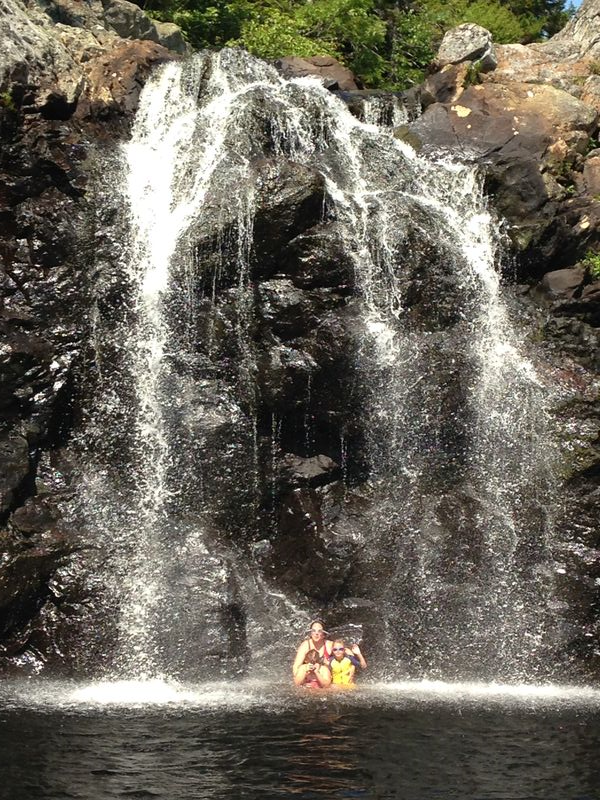 Yesterday, we went with our cousin visitors to Henderson Falls. 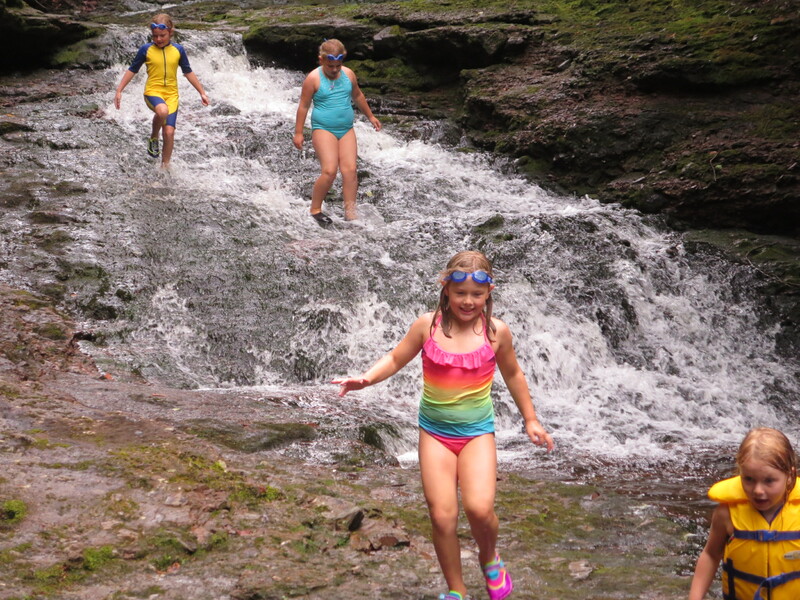 All the kids enjoyed climbing on the two sets of falls. 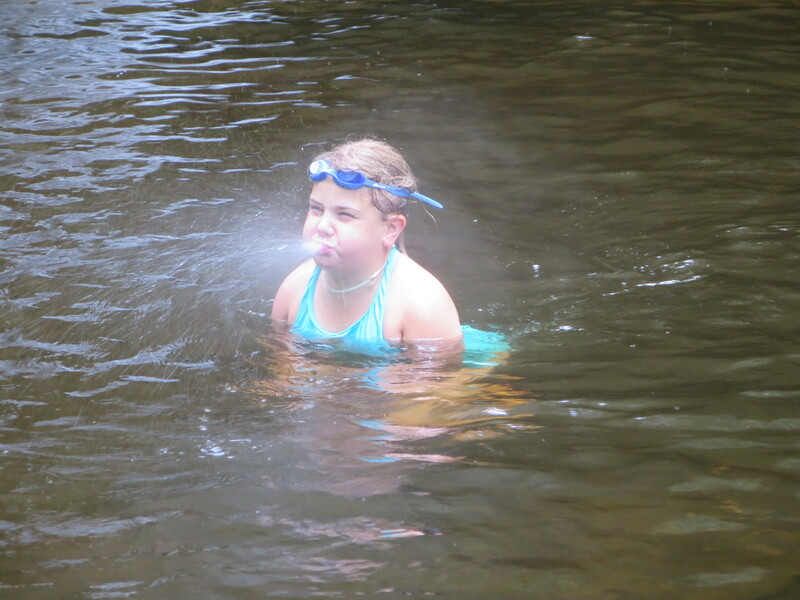 Here's Abby imitating a porpoise! 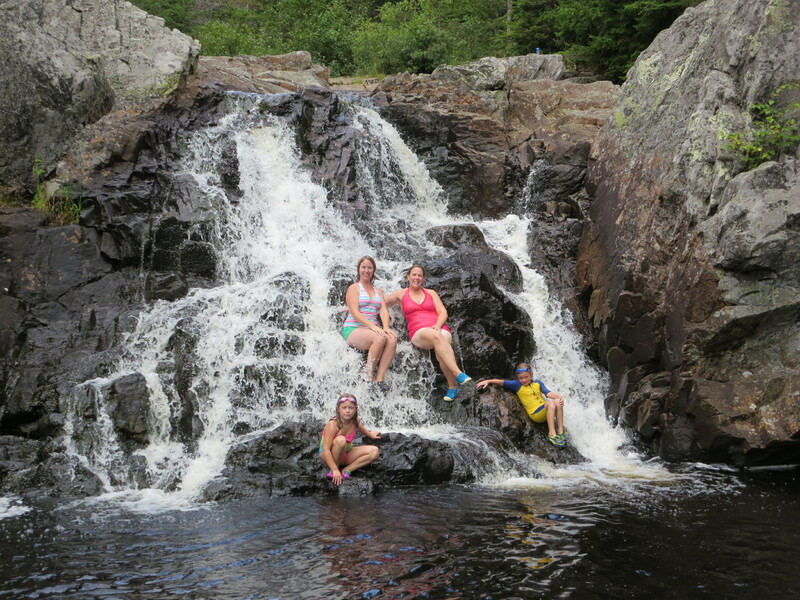 The group at Henderson Falls! Rebecca was climbing a bit around the lower falls. Today, we ended up back at Wallace Falls. 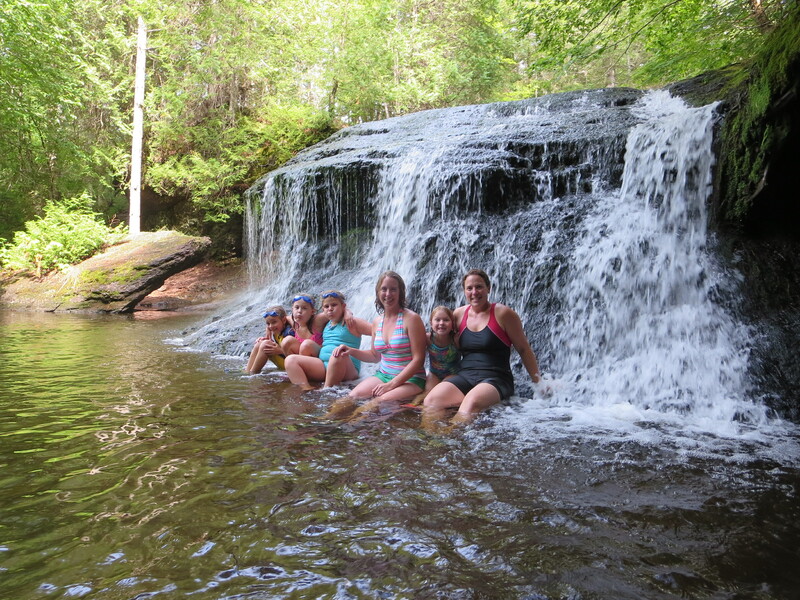 The group was enjoying the water underneath the lower falls. The group at the upper falls. Very relaxing apparently! 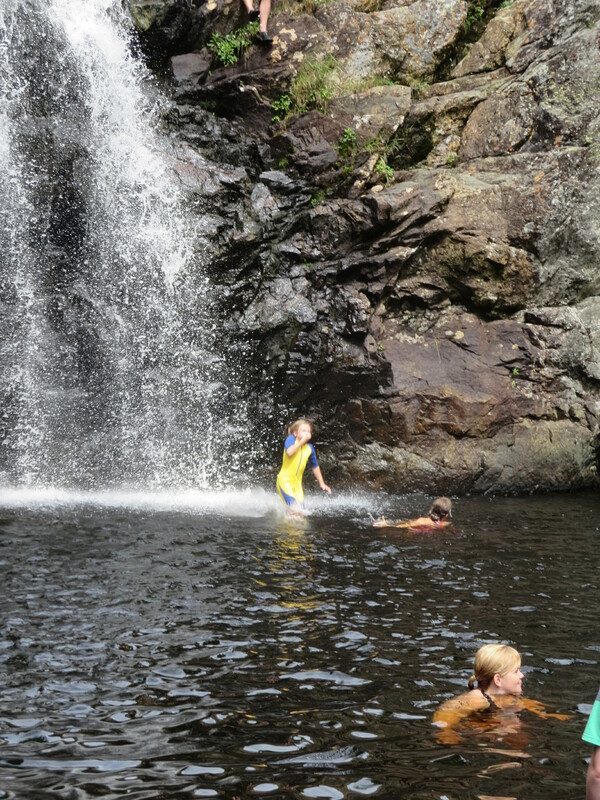 The both times we were there, there were quite a few 'young' adults jumping off the falls. Some were jumping off from the cliffs off to the right of this photo (Crazy!). Wanting for my 'young adult' days, I had to try it out myself from the centre of the falls. Rebecca made the leap, literally! 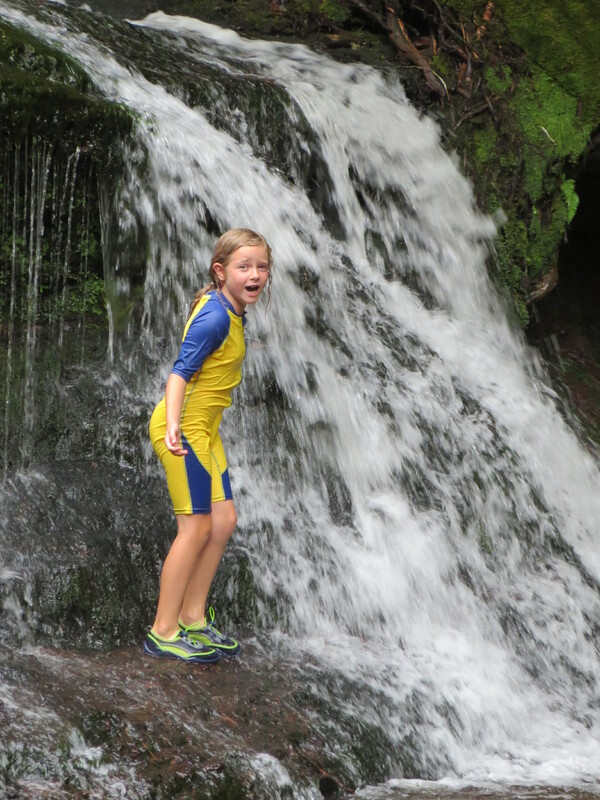 In this photo, first she tried jumping from a lower ledge. Following that, she jumped from the same ledge as I did earlier. 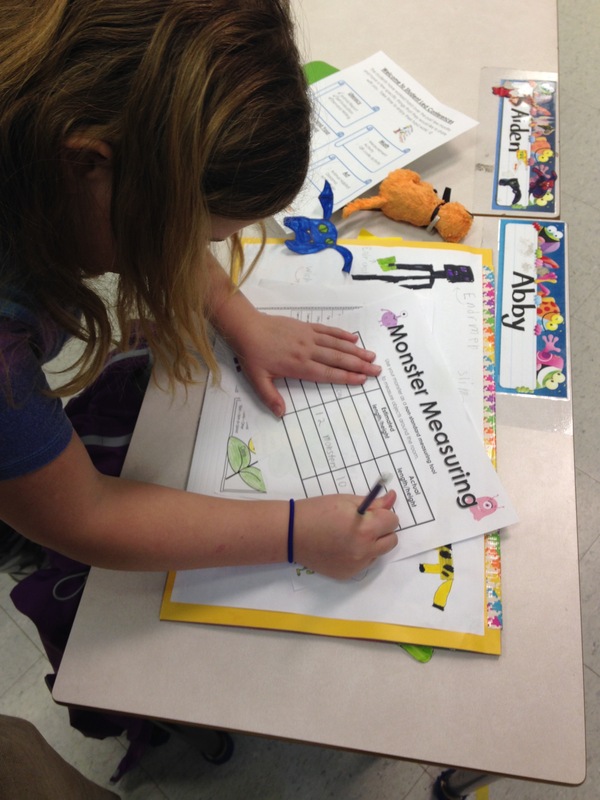 We were amazed at her courage! We just caught her in the photo before she hit the water. There was a quite a bunch of people watching her on the ledge. She was hesitant from the higher ledge for a while and said a few times, I don't know Dad. Then all of sudden she jumped! 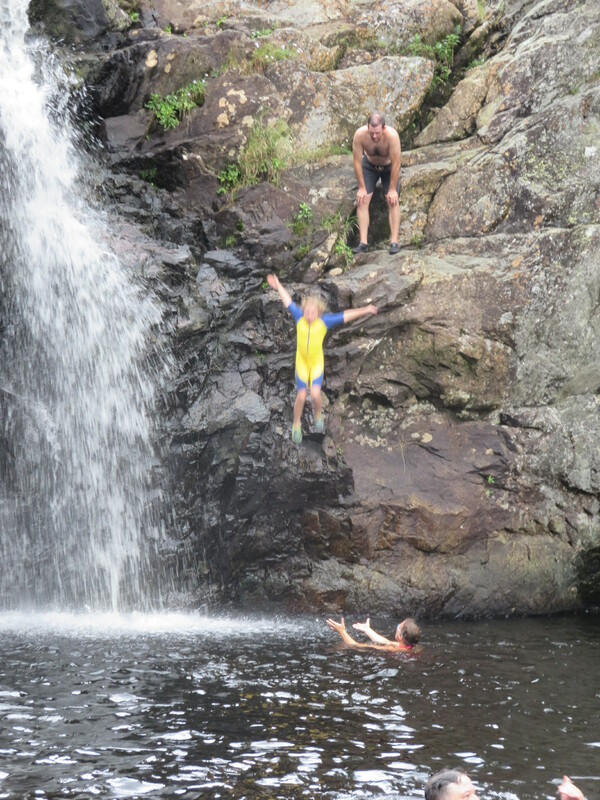 We all laughed as we couldn't believe she jumped from the same spot as all the adults had.